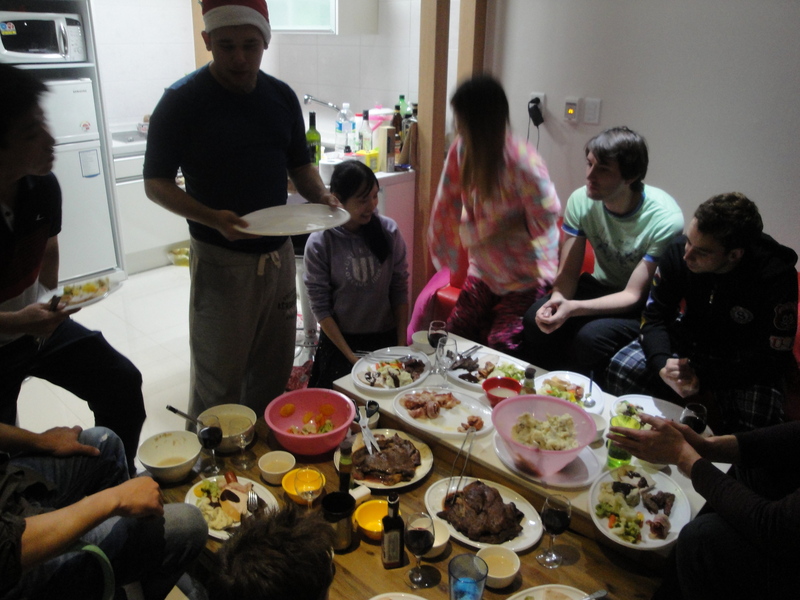 If you read my last post, you will remember how much food was at the Christmas Meat Beast Feast. 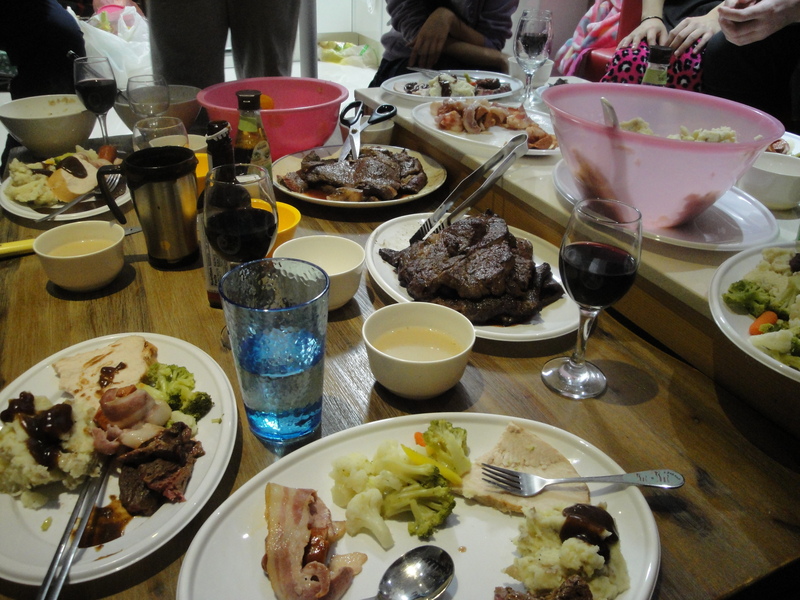 Our New Years Dinner was basically the leftovers, plus a few additional items. We had turkey, chicken, ham, potatoes, vegetables, pesto pasta (remember that most of this food was suppose to be for our Christmas feast) and drinks! The next part of the night included a lot of mingling, drinking and preparing for the 2014 toast. 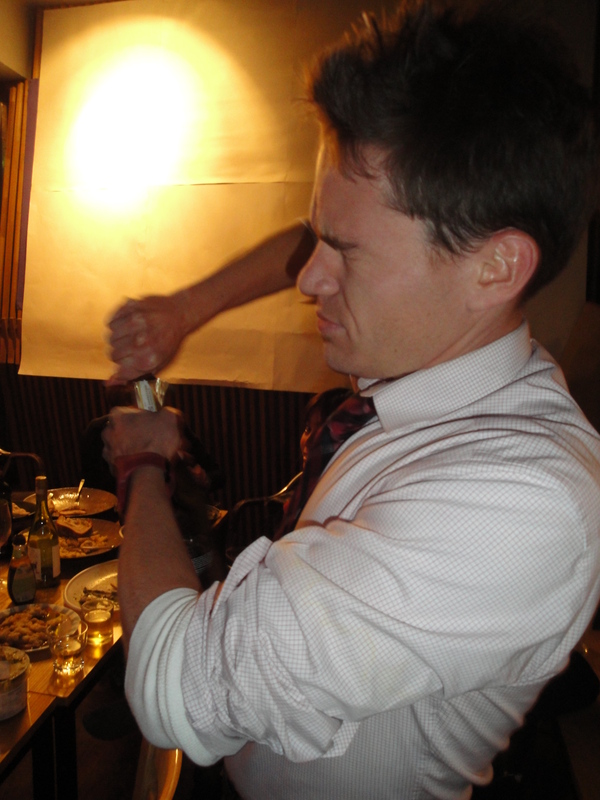 Kevin is getting ready to open the champagne. He thought is was going to be more difficult than it actually was. 2014! We made it! The countdown in the bar was great, we watched a K-pop countdown. At this point we had no idea we would be up for another 8 hours. 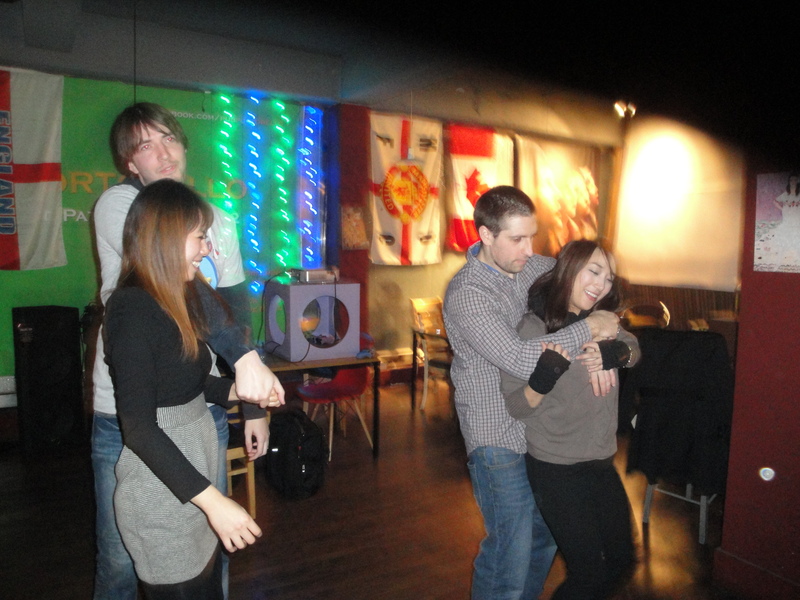 Lots of dancing was had, so we became the DJs of our own party (a lot of DJs = a lot of problems, ha). The night began to pass quickly and an absurd idea about staying up to watch the sunrise was tossed about. In Korea, watching the sunrise on the first day of the New Year is a bigger deal than staying up until midnight and toasting the New Year. 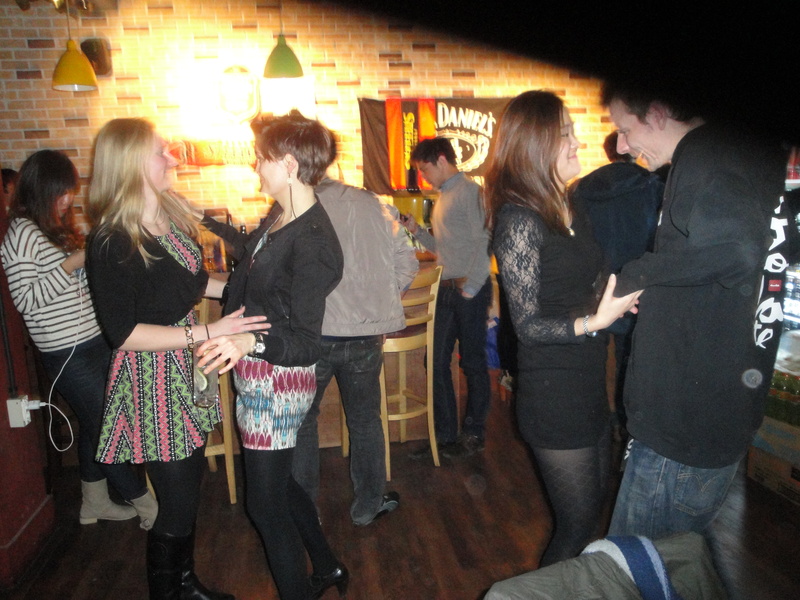 At the moment though, dancing was way more important. This was the point where many people started bowing out and heading home. It was also in these hours that the plan of going to watch the sunrise became less of a joke and more of a concrete plan. By 5am, my thinking was, “We have already stayed up this long and we might only be able to watch the New Year sunrise on a beach once…..might as well”. So the number of people continued to dwindle until there were only a few of us left in the bar, 8 to be exact. 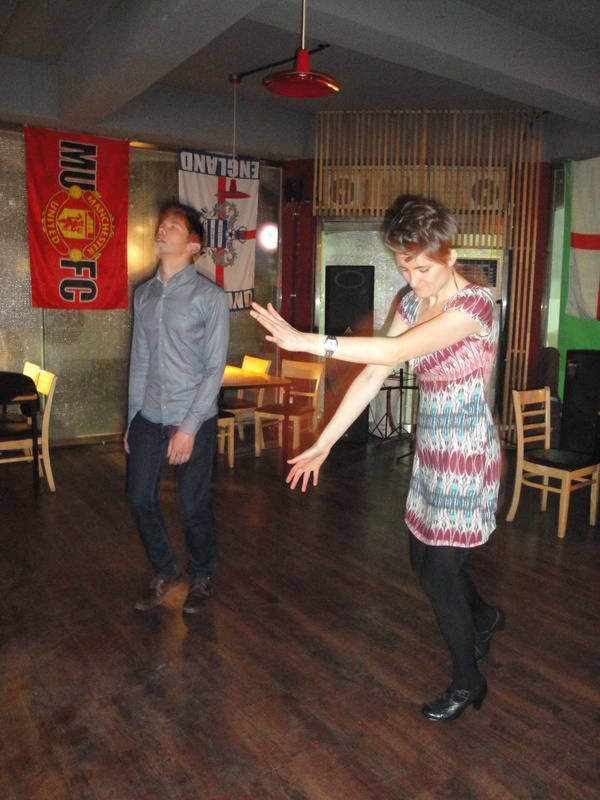 The dancing never stopped. 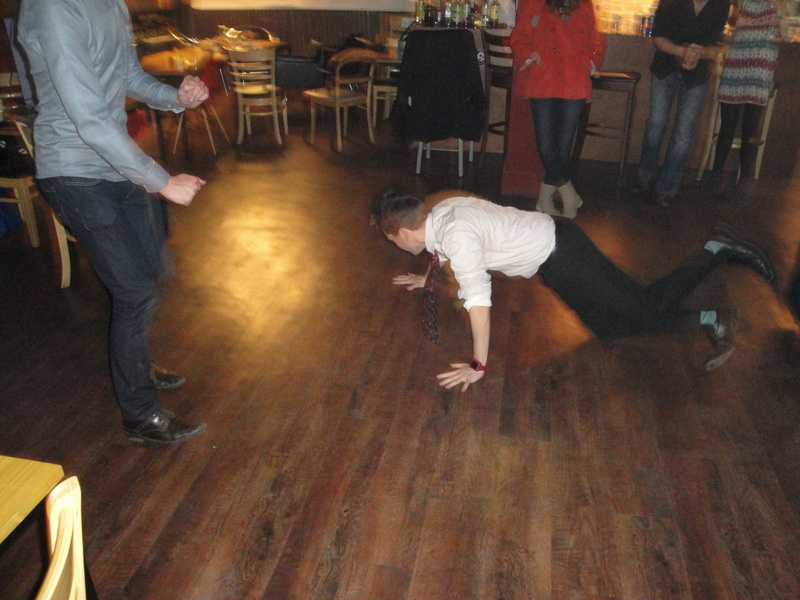 Here is Kevin doing his break dancing or something like that. The bar tender, Jamie, offered to drive us to the beach, get breakfast and watch the sunrise. We waited while he shut down the bar (I am pretty proud we closed down the bar at 6am… 8 solid hours inside this one bar, ha!). Then 5 of us piled into is small car and headed over to the beach. He dropped us off and then found a place to park. 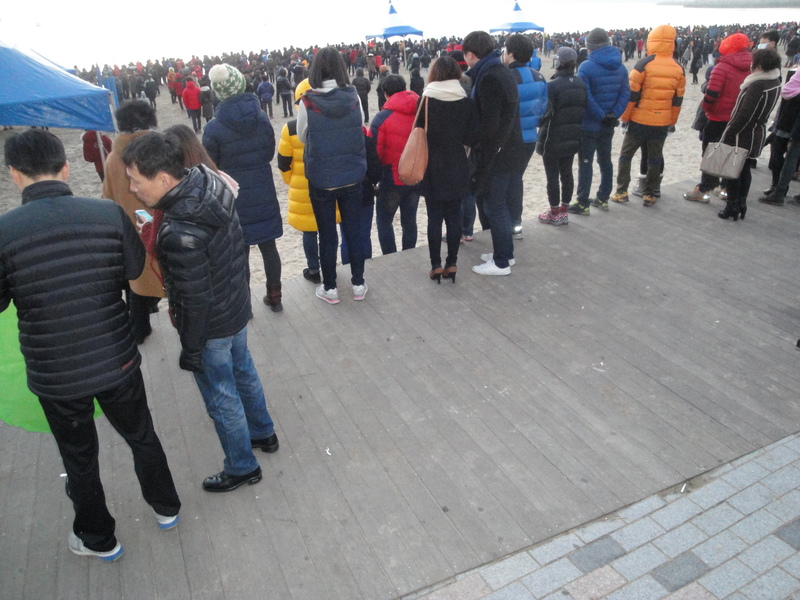 Since I had been in Pohang, I had never seen the beach so crowded and this was at 6am! 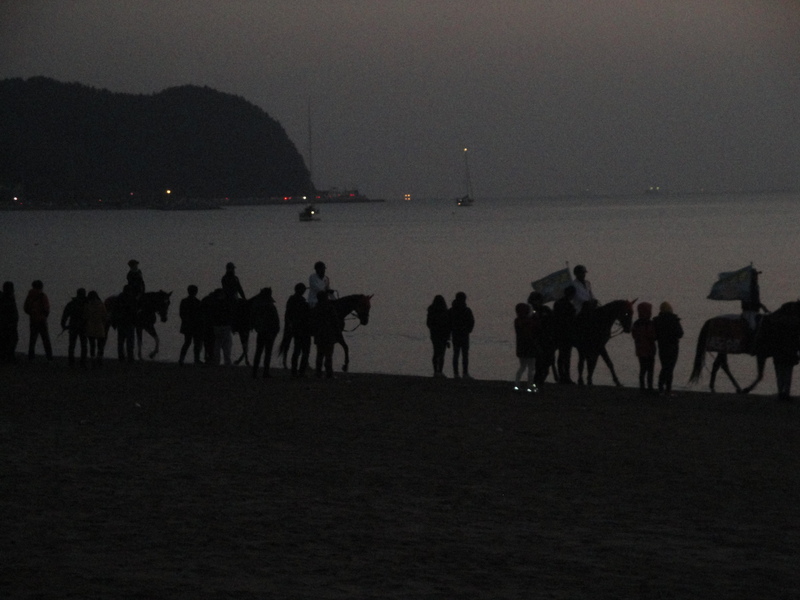 People were lighting lanterns, there were men on horses riding up and down the beach, and more boats in the ocean than I had seen before. 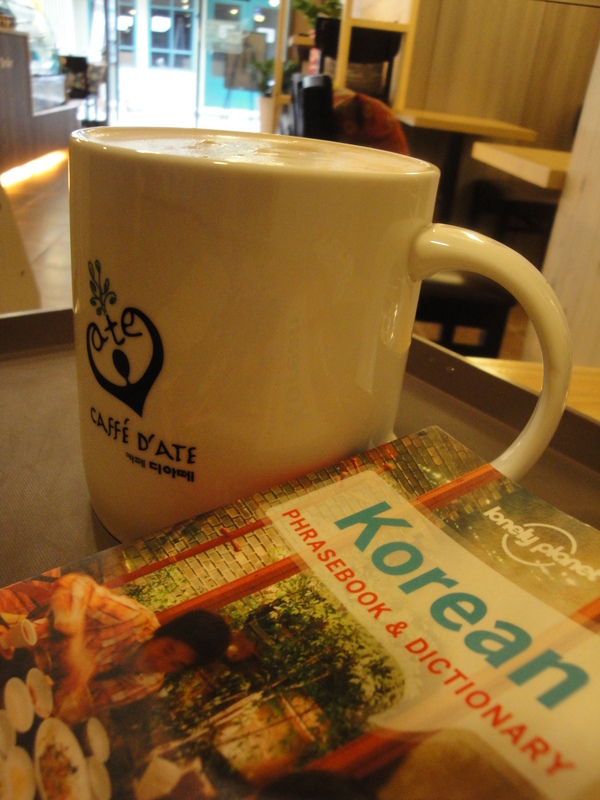 I loved seeing this part of Korean culture. 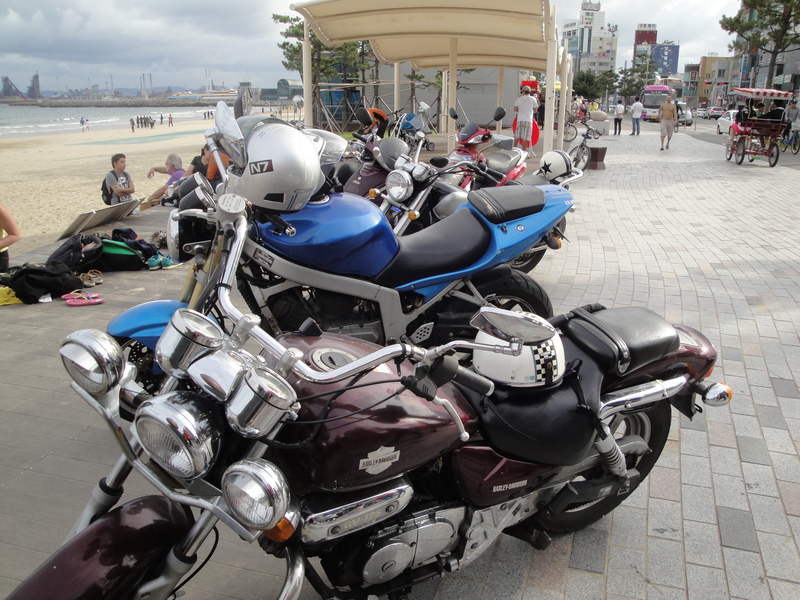 These men rode back and forth on the beach. I’m still not sure why, but it was pretty cool. 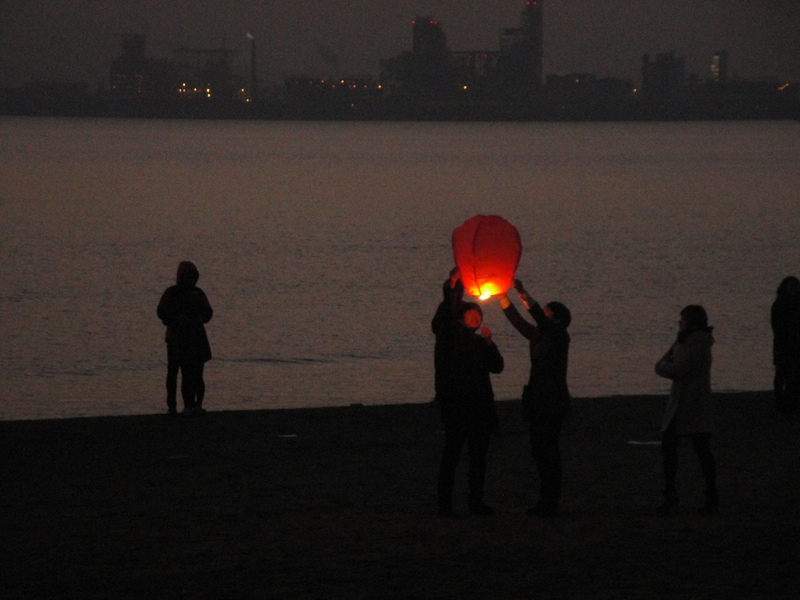 Lighting lanterns just seems like something you should do for the New Year. We did watch one man struggle and never get his lantern in the air, but most of the lanterns made it. 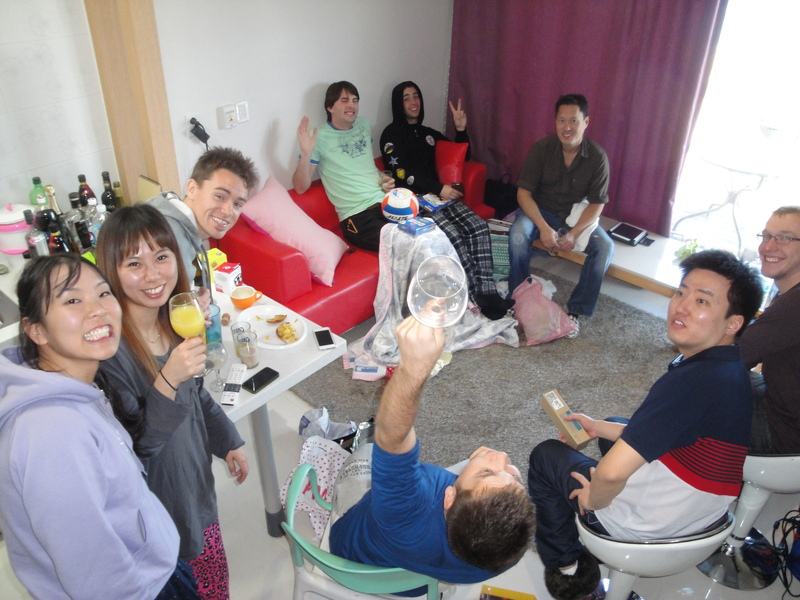 After we ate some breakfast, which consisted of baked fish, beer and soju (I did not drink the beer or soju). 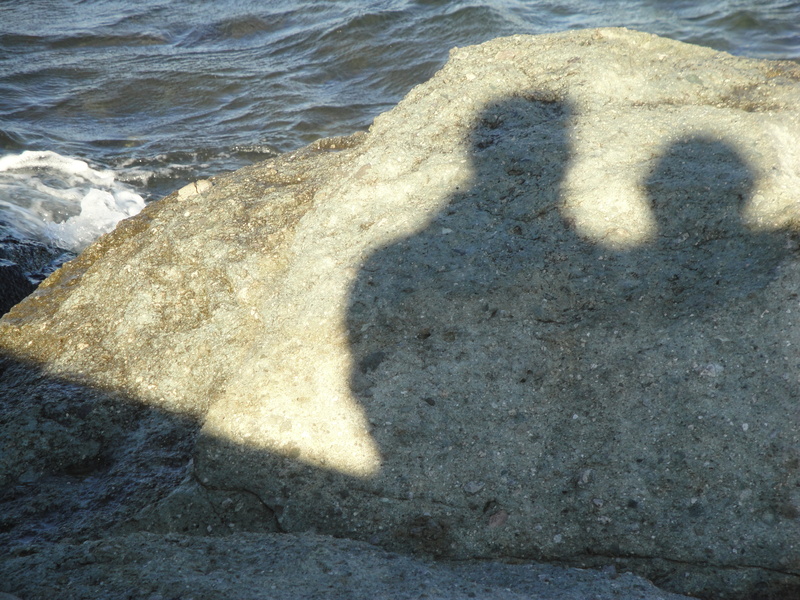 Kevin and I wanted to stand on the beach and make sure we didn’t miss the sunrise. My body was ready to quit and I really wanted to get in a cab, go home and sleep, but we were so close. The sky was getting light out, it definitely felt like morning, but there was still no sun. I wondered if all the pollution and haze would keep me from seeing the sun. Kevin and I decided to walk down the beach, past the crowds of people so that after the sunrise we could hail a cab and get to bed. It seemed like hours, really it was only minutes, until the sun finally peaked out from behind the mountain. We made it! Sunrise! 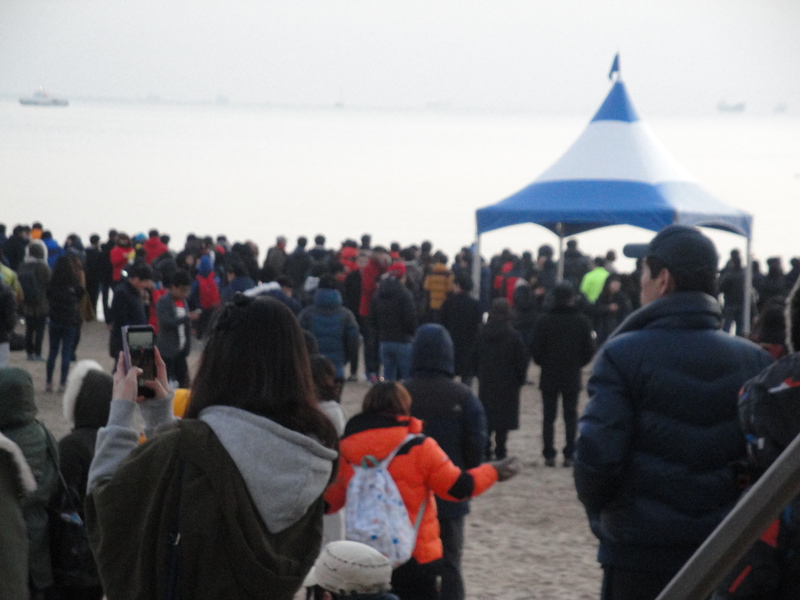 I expected cheering, clapping, whistles, but there was only the sound of hundreds of Koreans silently making a wish. The sunrise is much more important than midnight when the New Year is involved. The holidays are finally over and it’s time to fill in the blog world on what Kevin and I have been doing for the past couple weeks. First, came Christmas Eve. 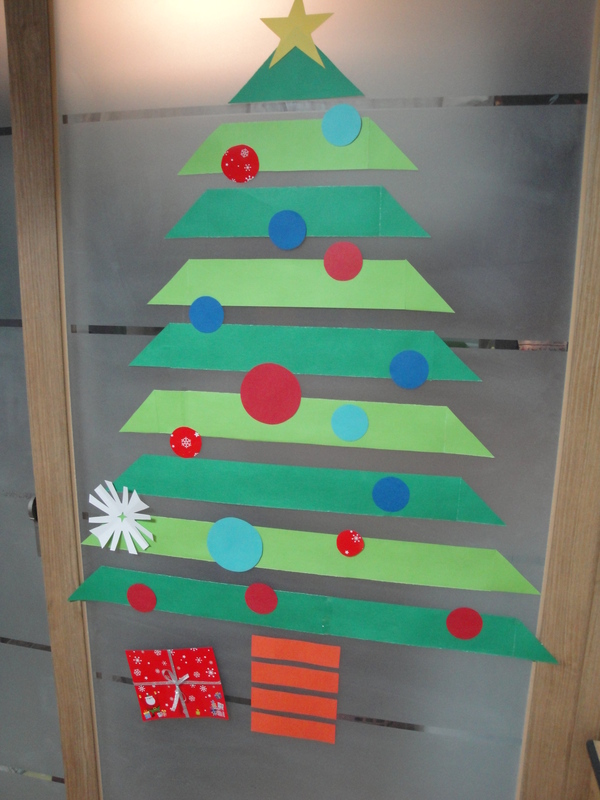 Unfortunately, this was the first year I was actually required to work on Christmas Eve. That was quite the change. 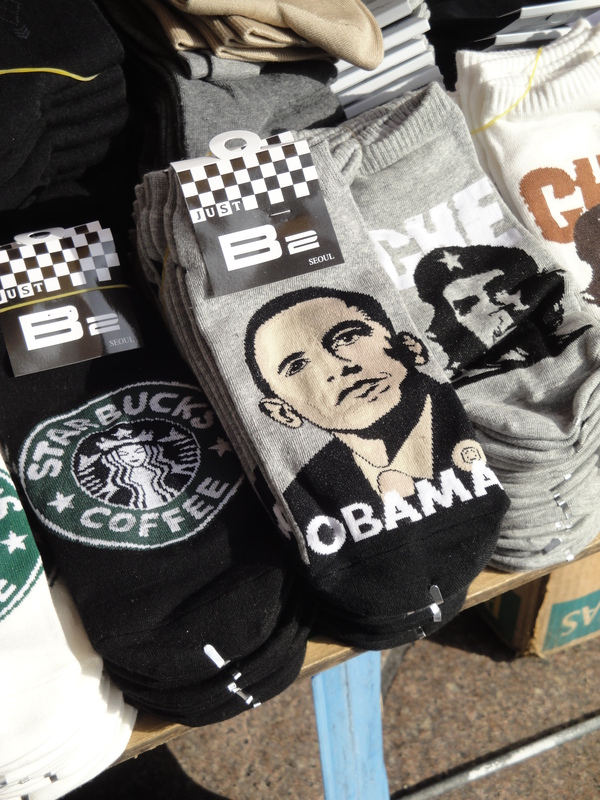 As I had mentioned in my previous post, Koreans don’t seem to get as excited as we Americans do. That didn’t stop us though! 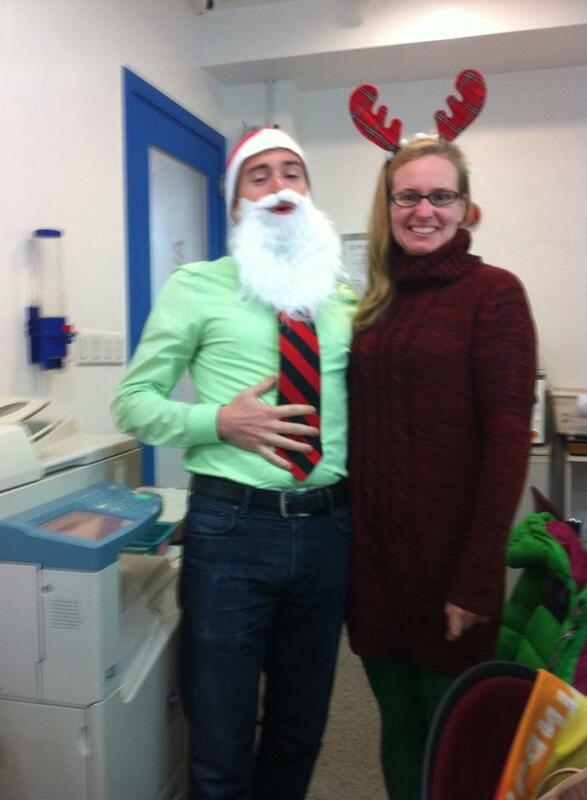 Kevin and me, all dressed up for Christmas Eve! Kevin sits under the “Christmas Tree” wondering what awesome present I have purchased for him. 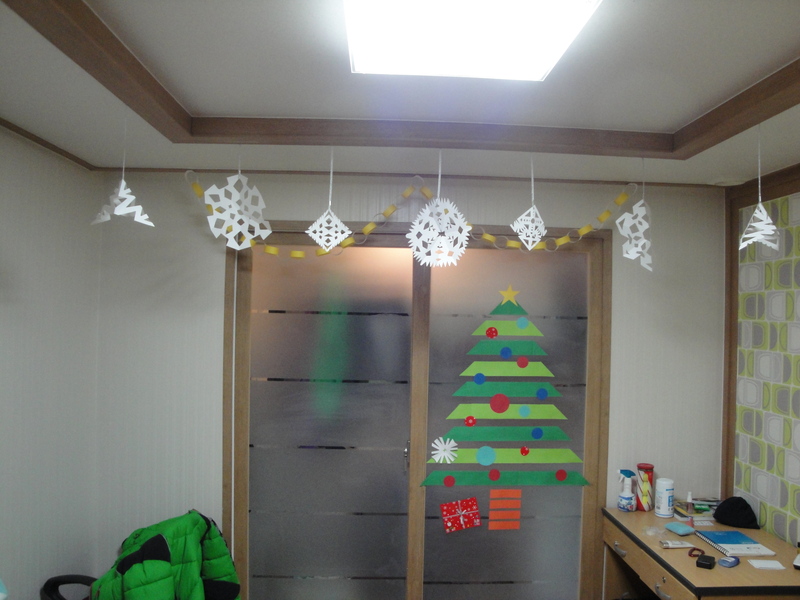 It was really fun to try to bring a bit a Christmas cheer to the kiddos on a late night at the Hagwon. I told stories about my childhood Christmas of Santa Claus, running down the hallways to a sea of presents, etc. 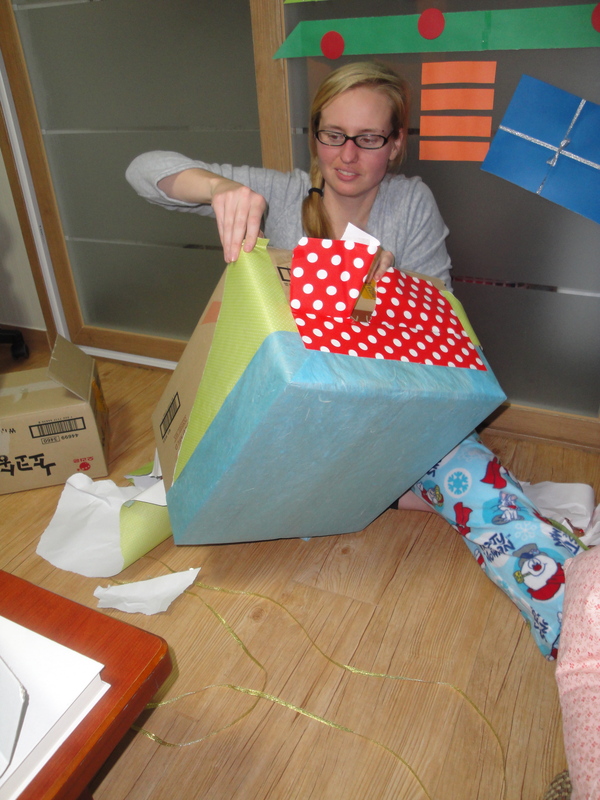 I then had one student tell me, “Teacher, I envy you.” Some Korean children might not get any presents for Christmas, it just isn’t done. I wish I could have bought them all presents, but I could only manage a few treats for some of the classes. 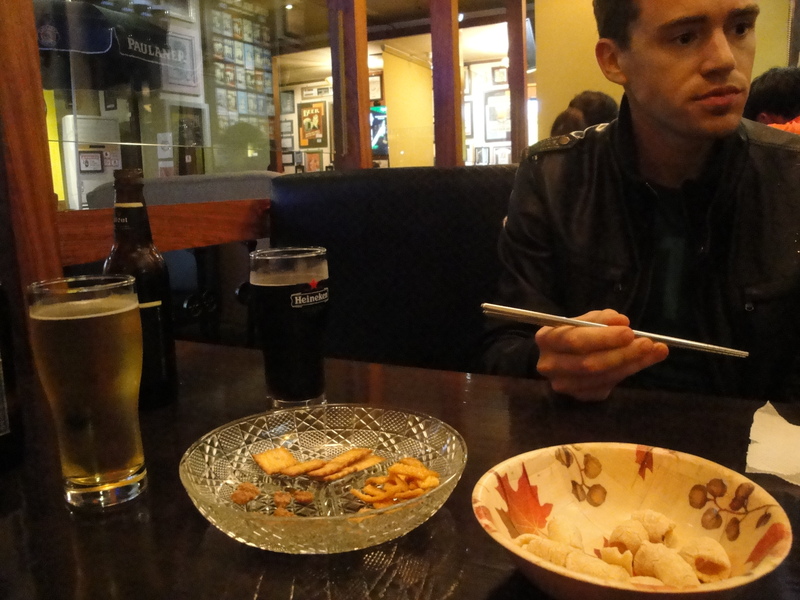 After teaching a lovely 6 hours at the Hagwon, Kevin and I headed over to one of our favorite restaurants, The Grill. This restaurant has some amazing dishes for a great price. Soon after dinner, our wonderful gift exchange began. I will share a few awesome highlights and you can scroll to the bottom of the page if you would like to see the full gallery. My prized gift from Kevin was an awesome, orange hiking bag (which has recently been put to good use…more on this later). 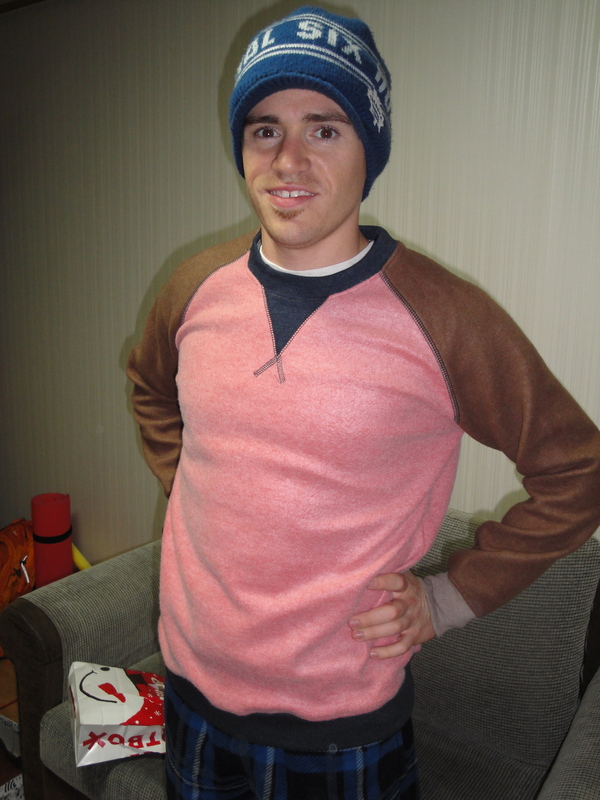 I gave Kevin some fashionable shoes and very nice sweater that he had pointed out a few weeks prior. 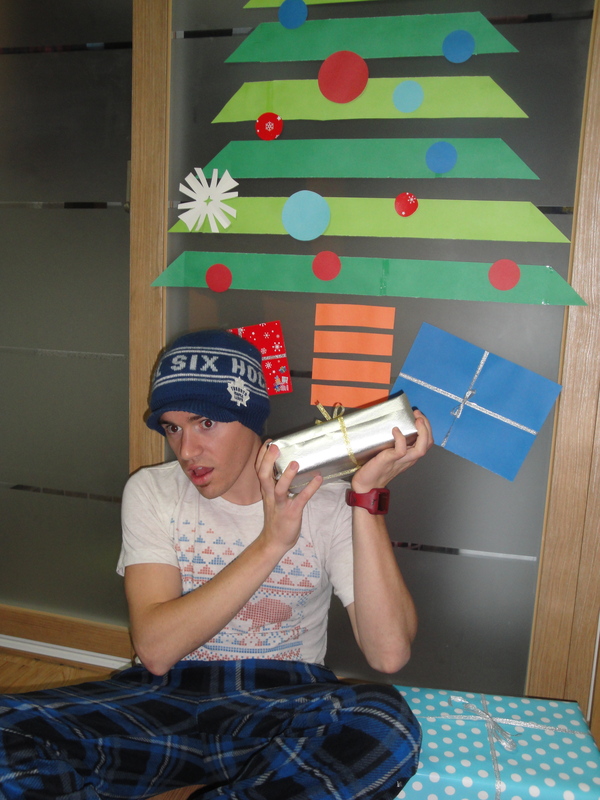 Kevin had to use 3 different kinds of wrapping paper on this beast. To the Cozy Sweet Pension! When Christmas morning arrived, Kevin and I made some tea in our lovely red kettle, wished each other a Merry Christmas and then it was off to the pension! For those of you who are not aware of what a pension is, it is usually something reserved by couples. It is a small two person condo near either a beach or scenic area. 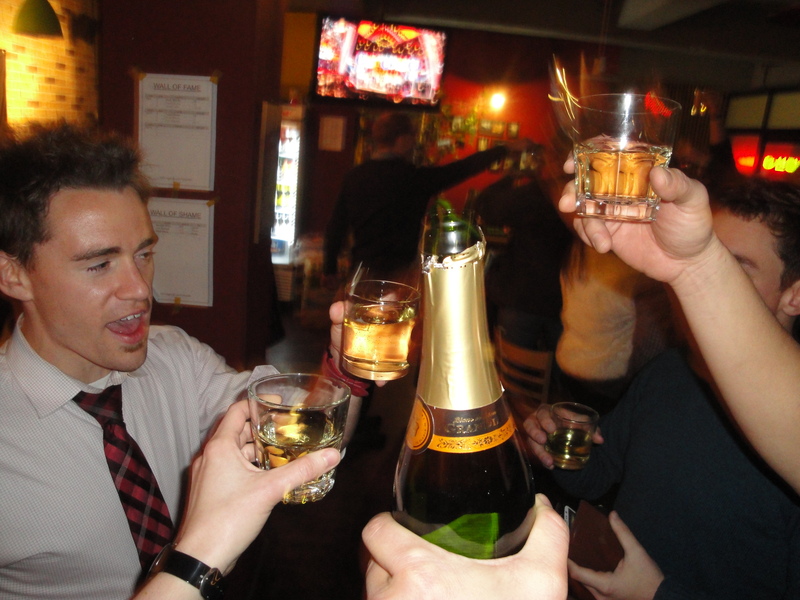 We had decided to split the pension between ten people (quite the cost savings). 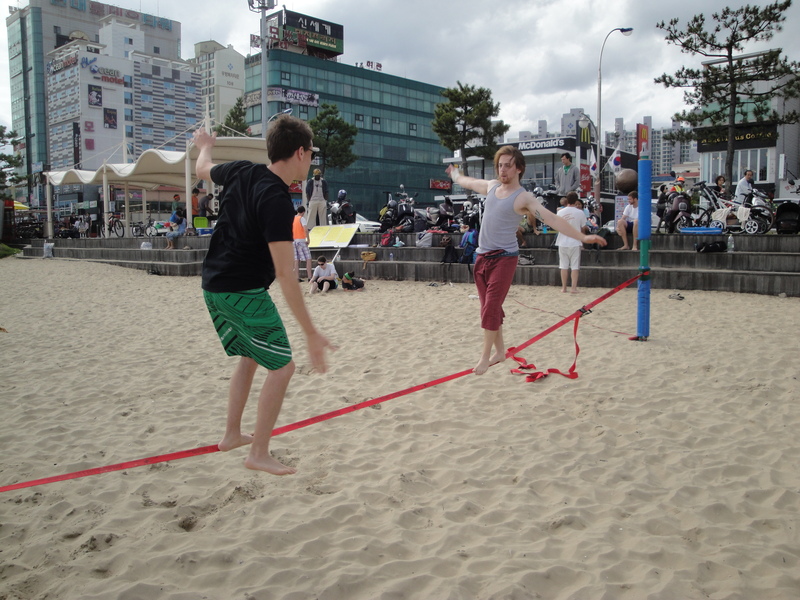 While at the Cozy Sweet pension, many activities took place. 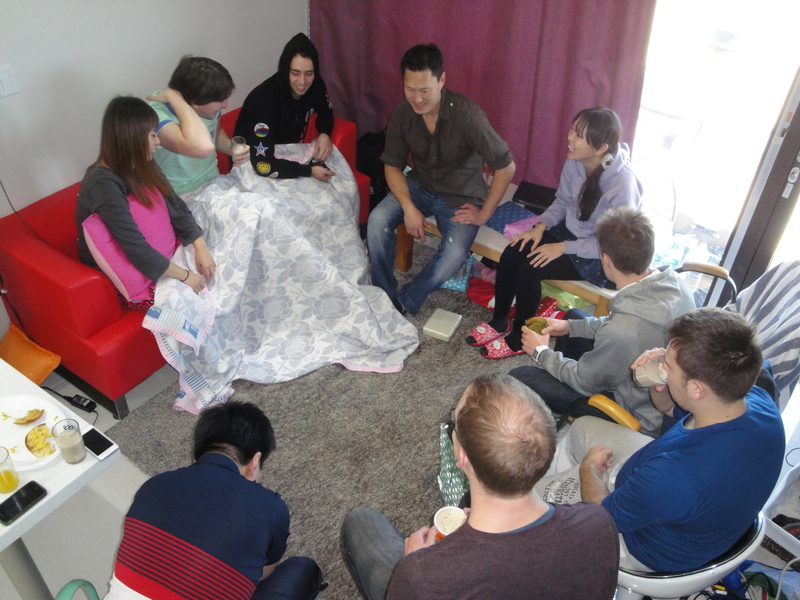 Among them were Secret Santa, White Elephant, Meat Beast Feast, Celebrities in a hat, FIFA, Super Smash Brothers. I am so happy Kevin and I had the opportunity to celebrate Christmas with some great friends. The pension was a great idea and cost effective once split 10 ways. We also ended up having an enormous amount of extra food, which meant….Kevin and I got to eat steak and potatoes for a week (I still have a bunch of potatoes left). Furthermore, the left over food was used one week later in our amazing Christmas Dinner: Take 2 (really it was just New Year’s Eve Dinner). 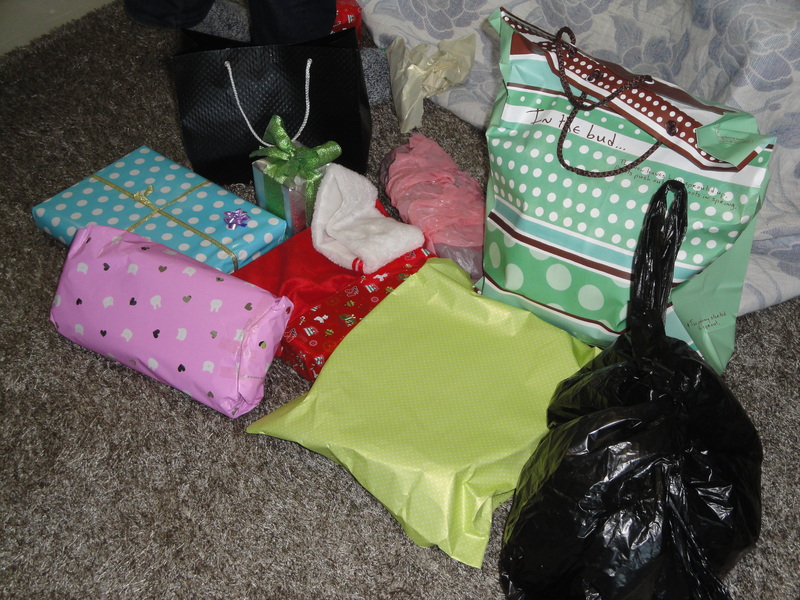 White Elephant gifts, there was only one or two completely unusable gifts (hint, the one wrapped in a garbage bag). Let the white elephant stealing begin! Sunwah was the recipient of my amazing coin box, complete with American money and stickers. 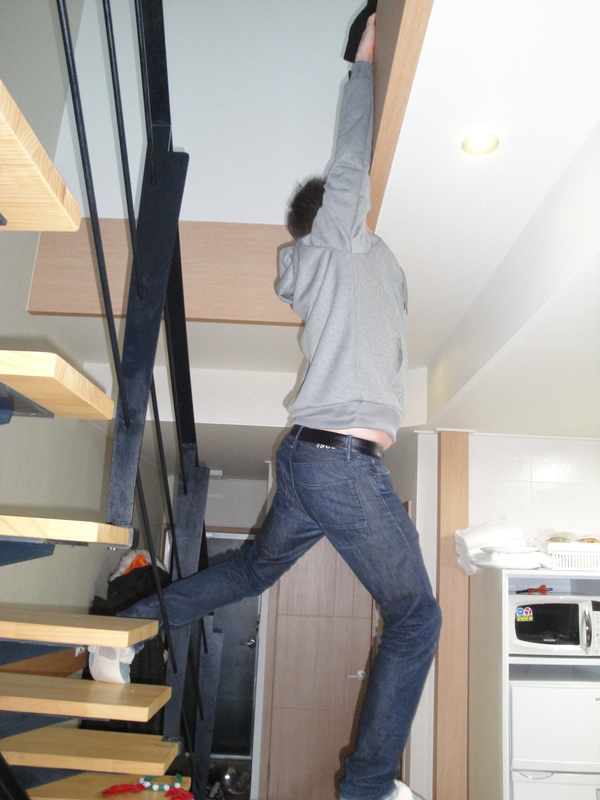 Kevin must always be climbing something…the ceiling was no exception. The tiny kitchen where our immaculate feast was prepared. Meat Beast Feast 2013. So much steak. 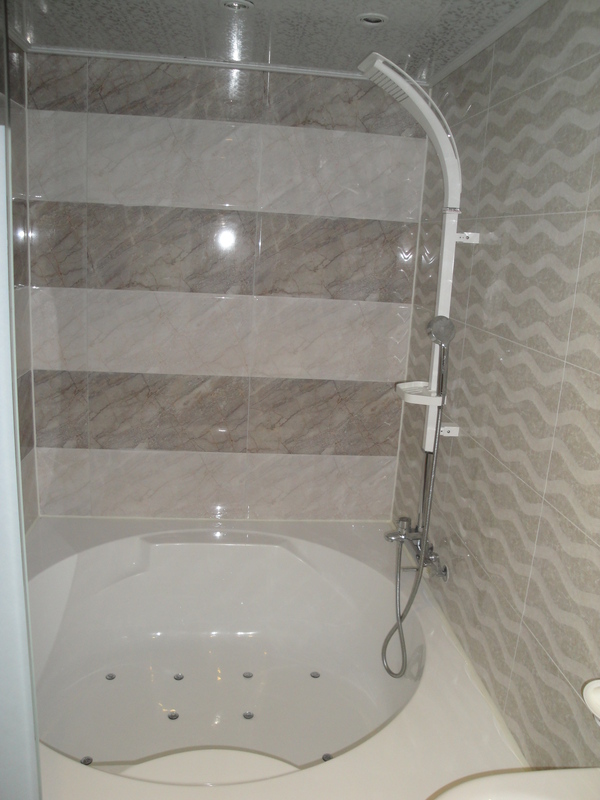 Most apartments are heated through hot water pipes in the floor. I actually love this in the winter because the floor is never cold (except in the bathroom). However, I have run into trouble when we were first figuring out the heating system. 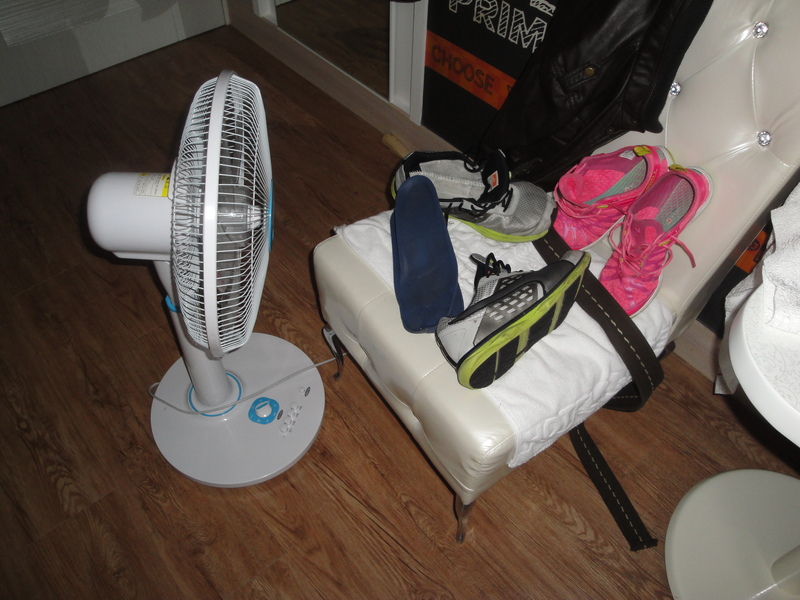 I accidentally turned the heat up pretty high and when I came back home the apartment was really hot and couldn’t walk around in my bare feet, the floor was so hot! I haven’t made that mistake again, apparently it might break the pipes as well (or so our landlord believes). Kevin is ready for some serious scootering now. The brightest hiking back ever. I love it! Look at all these pockets! Yes! New apartment and my mad decorating skills! It’s that time of year again! Christmas time and also, blog post time! Since we haven’t been traveling or doing much else besides teaching, I haven’t updated the blog in a while . 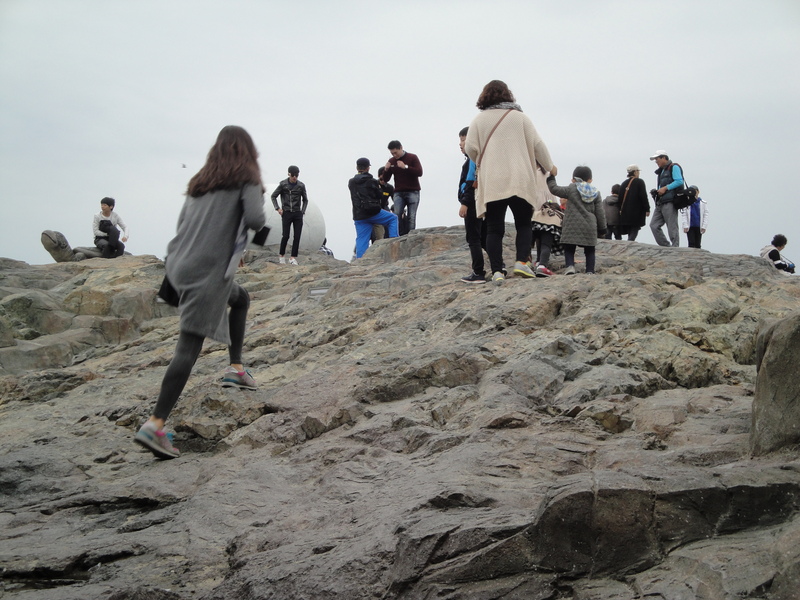 Winter certainly seems to shut down a lot of the activity in Pohang (well, physical activity). As much as I enjoy all the mosquitos being dead, I will be happy when summer rolls around. We have managed to remain somewhat active during this hibernation period. In the past couple of weeks Kevin has been playing quite a bit of soccer. The team he plays for, The Ironmen, had their team banquet and Kevin won ‘Most Improved Player’ of the season! He also won the ‘Man of the Match’ title during one of the soccer matches. Go Kevin! Unfortunately, for me, sand volleyball isn’t really much of a winter sport. 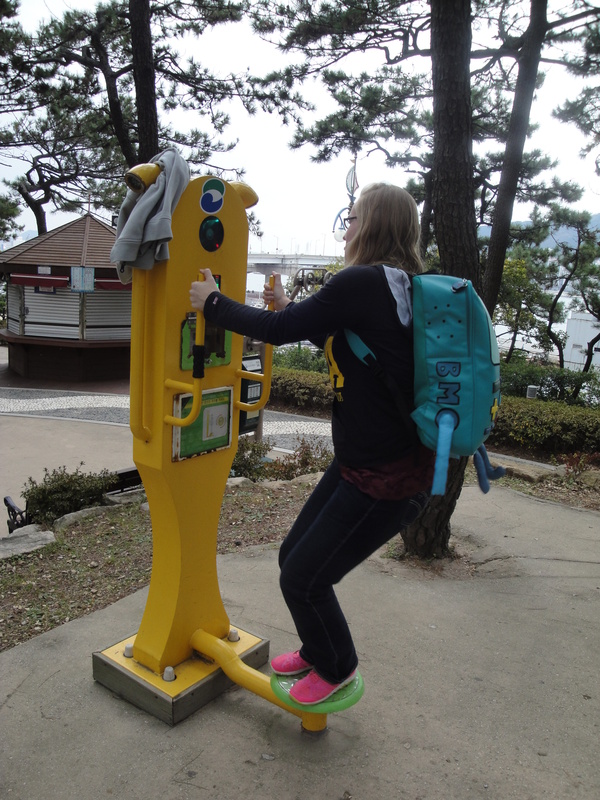 I instead, have been doing some walking and hiking around Pohang (also using all those handy-dandy work out stations that appear to be everywhere in Korea). I can’t wait for the weather to warm up and get back on the beach. 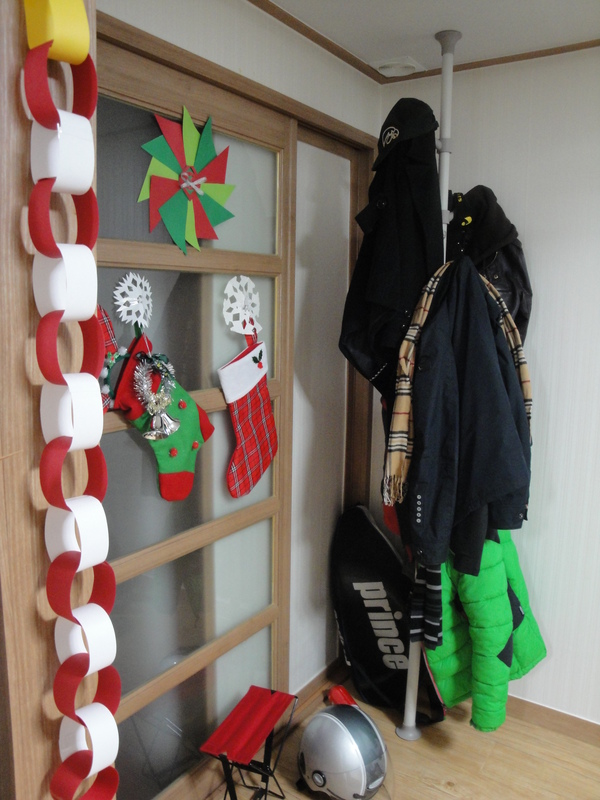 We have finally gotten our apartment mostly furnished and I went on a bit of a low budget holiday decorating spree. Below are some pictures of what the apartment looks like! 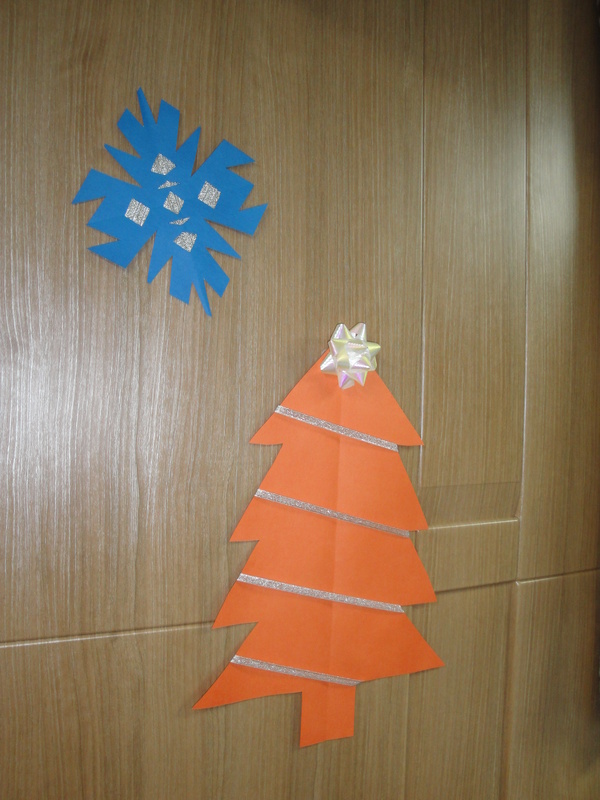 Our lovely living room, complete with Christmas tree, presents and snowflakes! Oh, and SANTA!! 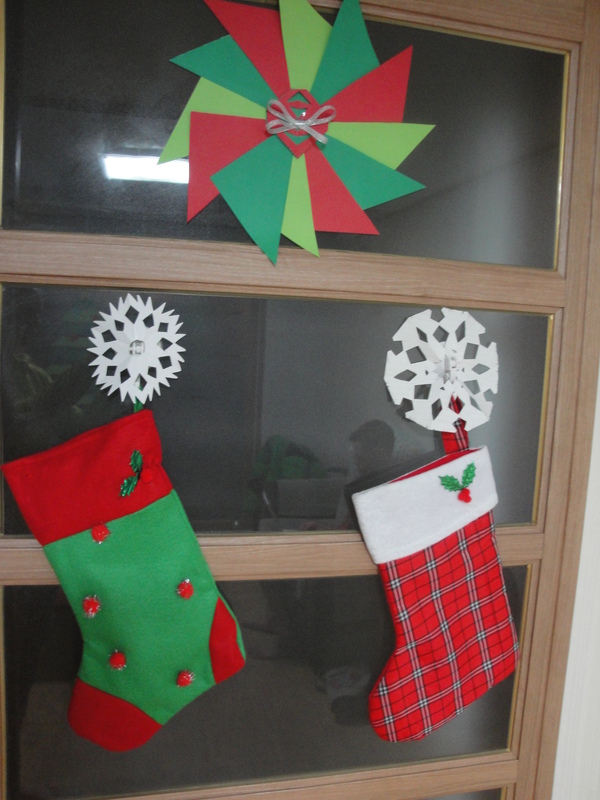 Look at those lovely snowflakes and kickin’ stockings! Did I mention that all of the decorations cost less that $8! 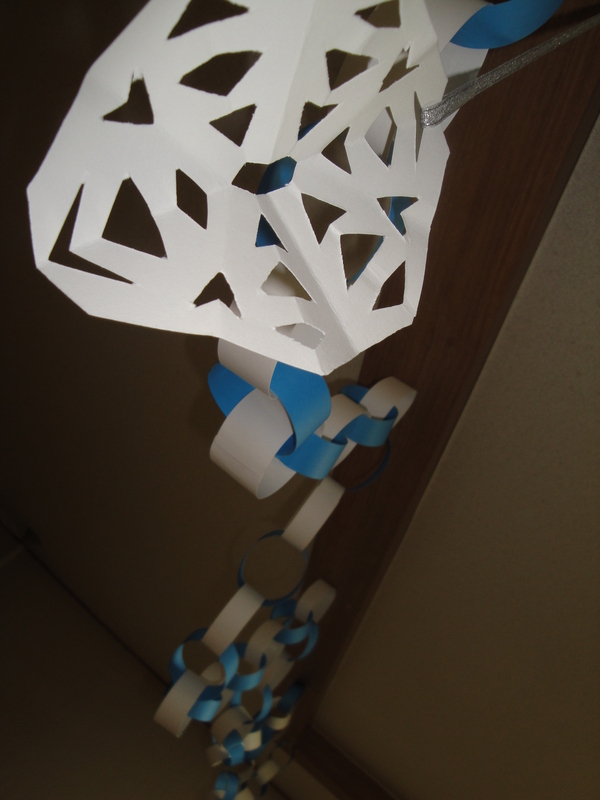 I did spend a good chunk of my time creating said decoration though……WORTH IT! And now for some more bland pictures of the undecorated parts of the apartment. 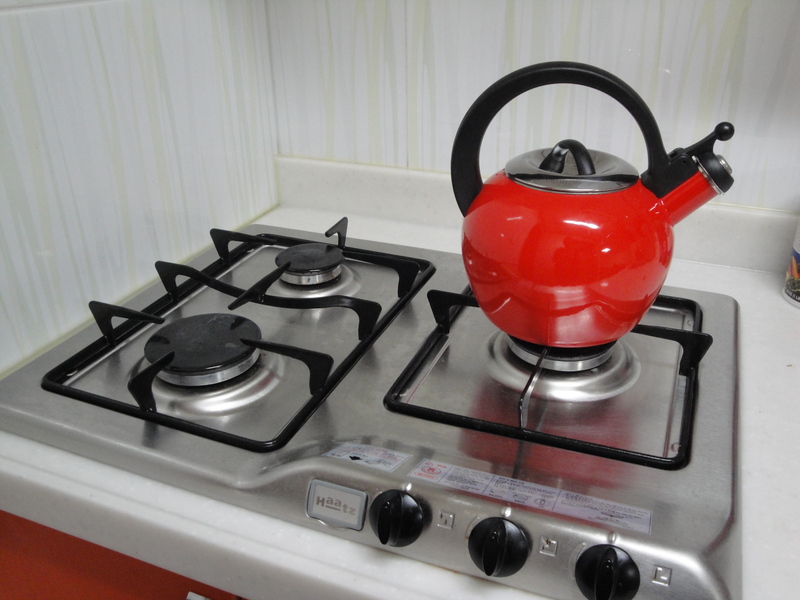 The amazing tea kettle sent to us by Kathy Sawrie (Thank YOU! We are drinking so much tea thanks to both the Sawries and the Jordans), and our tiny, bitty kitchen wall….that’s really what it is, a wall. Once again, our bathroom that is basically a shower stall with a toilet and sink in it, but still very stylish and awesome. Also, we now have an additional bedroom, instead of last studio style apartment (this is where Kevin sits and plays game cube all day long, just kidding…not all day). Happy Holidays to all who are reading my post. Kevin and I wish we could be with family and friends back in America during the holiday season, but we are also excited to spend the holidays in the company of our good friends in Korea! 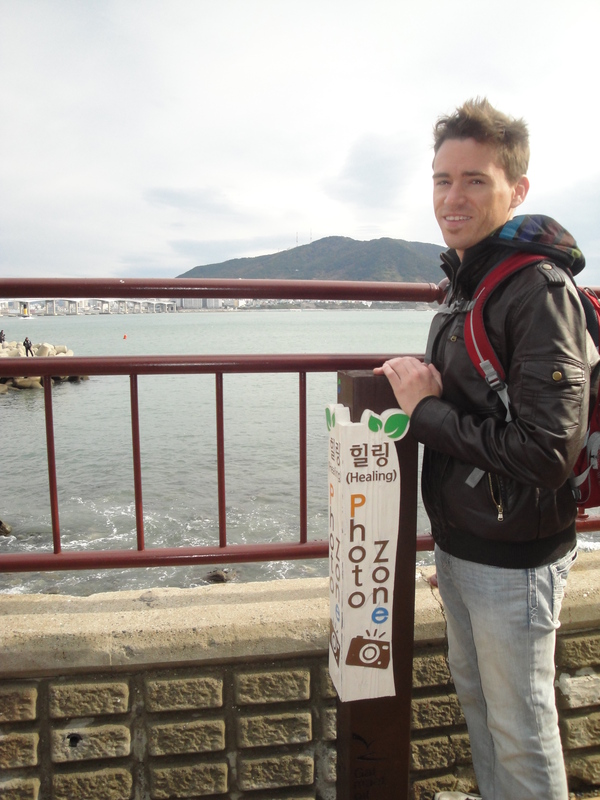 The weekend of November 10th, Kevin and I decided we wanted to get out of Pohang for the first time since we had been in South Korea. 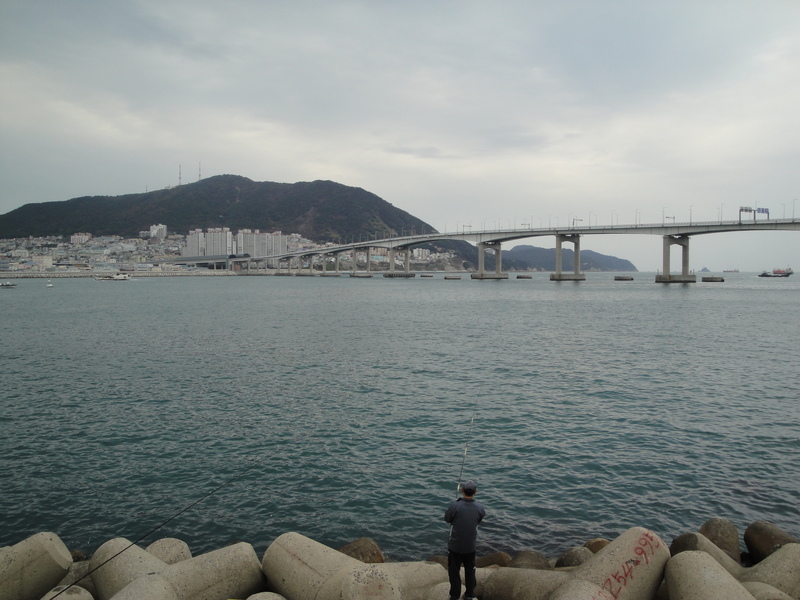 We hadn’t yet been to Busan, so that became our destination. We made almost zero plans. 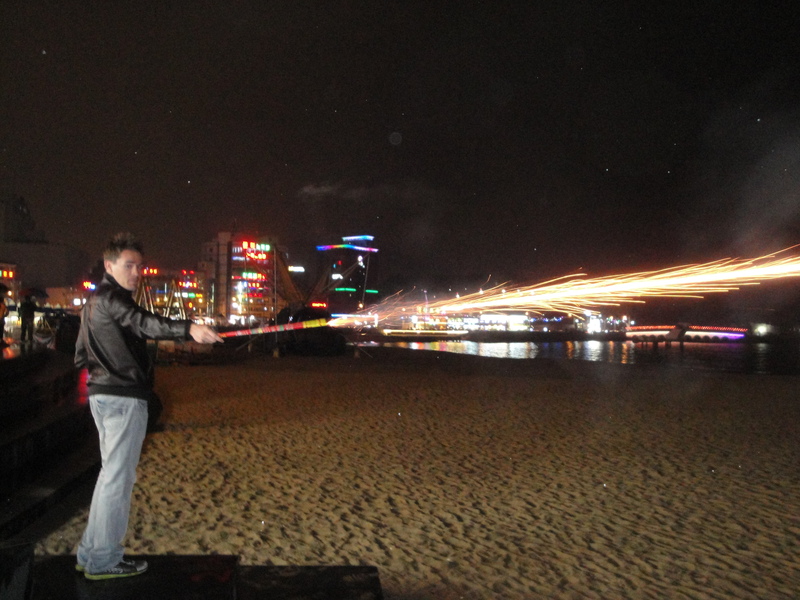 The night before we left, I found a light festival happening at Songdo beach. Hooray, we had found part 1 of the plan. 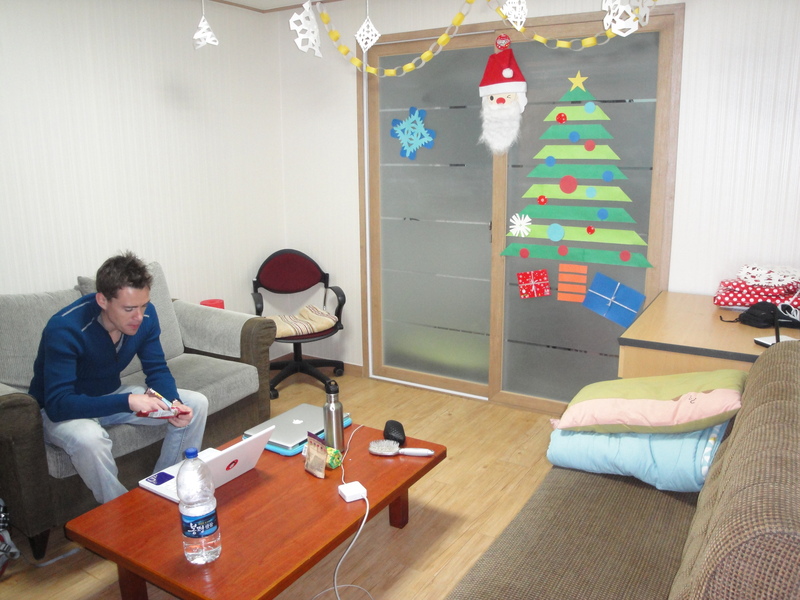 There was no time to get a couch surfing host set up, so we just opted to find a hotel when we arrived in Busan. What you are about to read is Kevin’s writing about our trip. 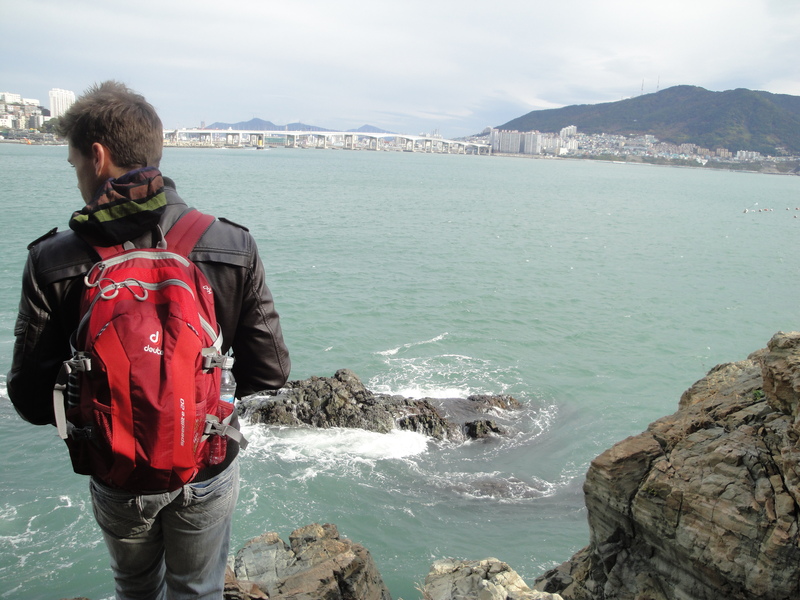 I hope the details and pictures bring you along into our BUSAN ADVENTURE! 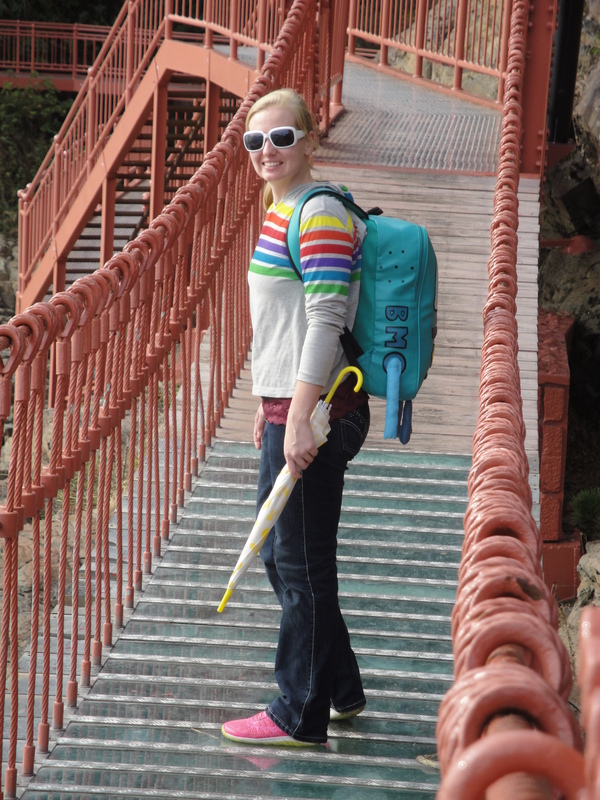 Not counting the terrible downpour and my painfully sore knee, the trip to Busan was wonderfully pleasant and surprisingly convenient. We had been told that taking public transportation around Korea was simple, but we had yet to try it for ourselves until that Saturday. 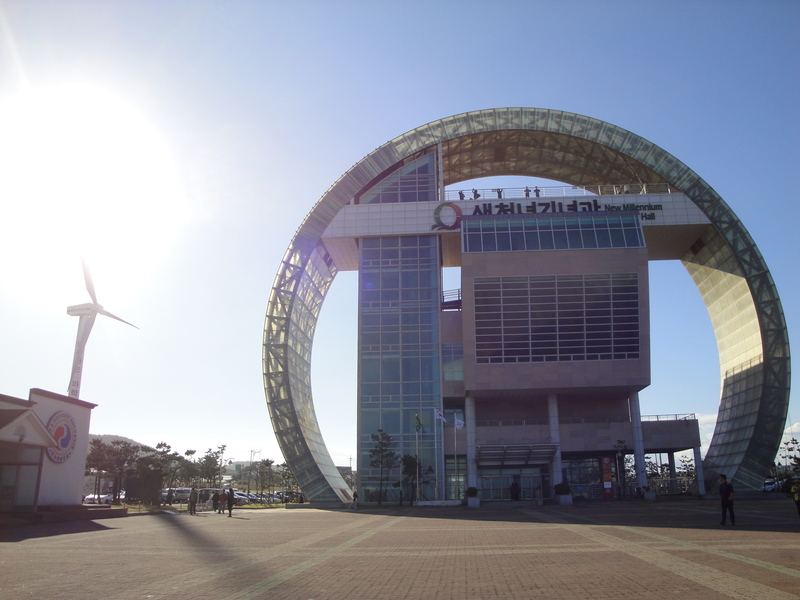 Granted, we did take a bus from the Incheon Airport to Pohang the day after we landed, but that had been planned from the night before and accomplished through an 8am wake up. 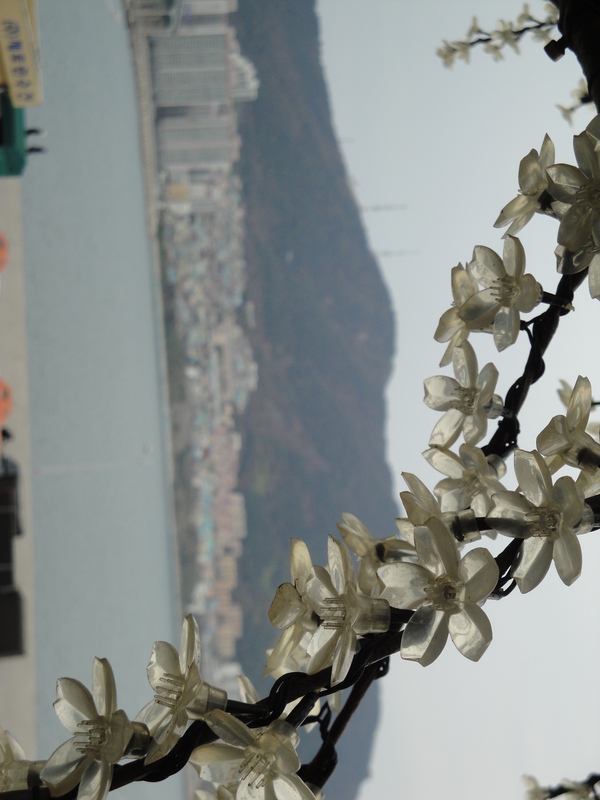 The Busan excursion was more off-the-cuff. 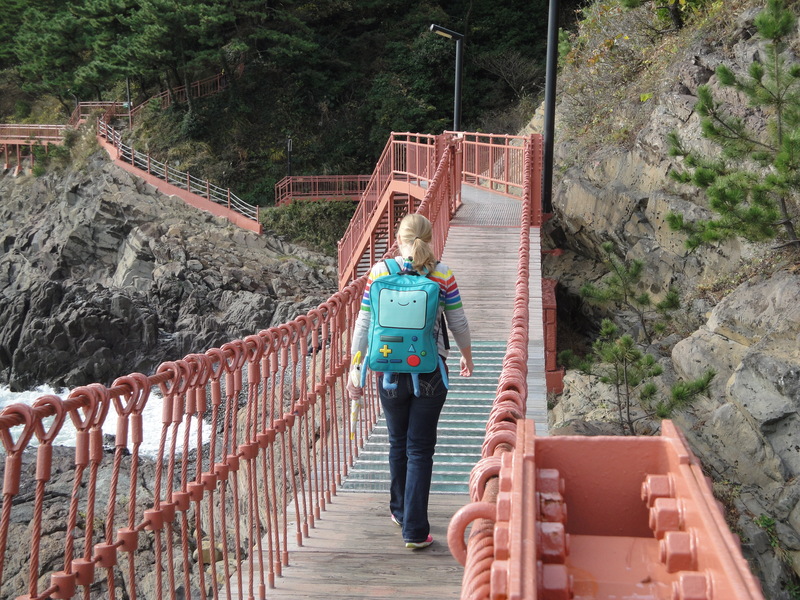 Christina and I packed our bags in the morning, headed to our favorite gimbap shop for breakfast, and then caught a cab and asked to be taken to the bus terminal. I had been to the terminal once before, so I knew where to line up for tickets and the importance of figuring out the correct platform. 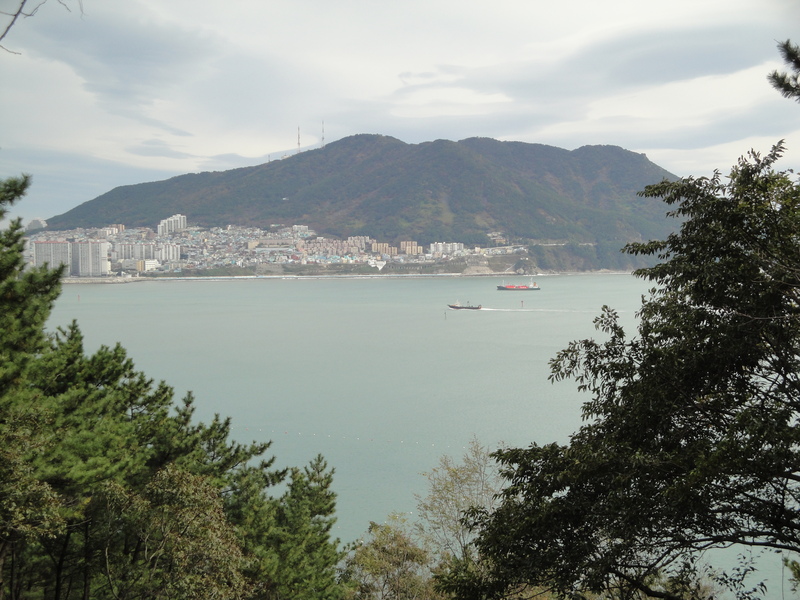 I purchased two tickets for Busan, which cost a little more than 16,000왼 ($16.00) and as soon as we walked outside a bus was waiting for us. It isn’t that we were very fortunate to catch the bus at the last minute; it’s thanks to the fact that buses leave for the major cities around Pohang every 5 to 10 minutes. 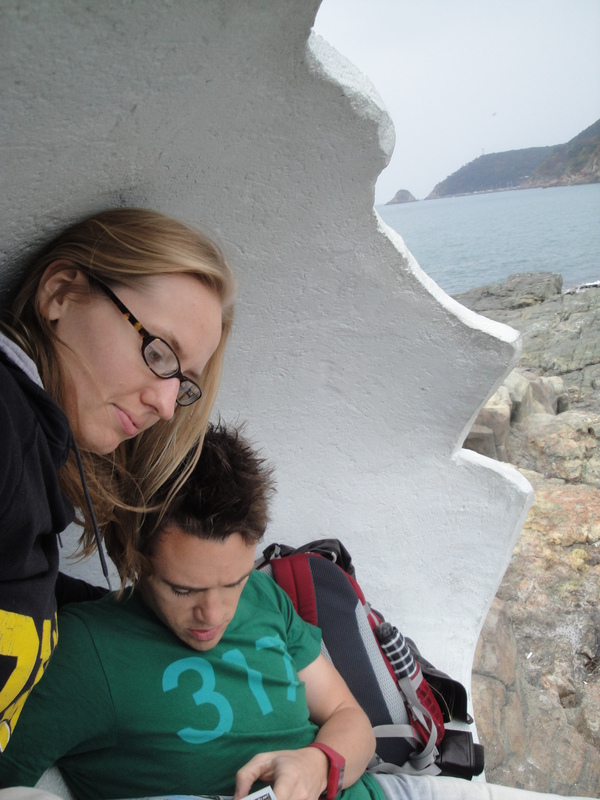 It only takes 85 minutes to reach Busan by bus, which was a great time for Christina to take a nap and for me to read a great chunk of A Wrinkle in Time. The bus comes to a stop at the northeastern outskirts of the city. 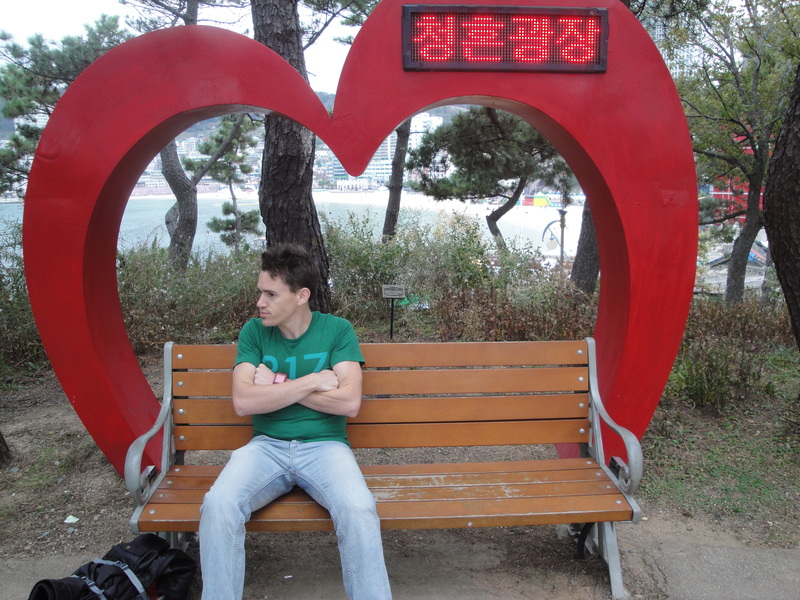 It was at this stop that we had to brave a new form of transportation, the Korean subway system. I grabbed an English tourism map from an information counter inside the station and planned our route to Songdo beach, where Christina and I had made plans to watch a “Port Lighting Festival.” On a small side note, I must praise the Korean public transit card they call a “Pop Card.” The Pop Card can be used throughout the entire country to pay for buses, subways, trains, and taxis, and the cards are easily loaded with money at most convenience stores. Using the Pop Card saves about $.10 per transaction, but the real benefit is the time and convenience it affords. So we swiped our Pop Cards to get to the subway platform. The map was very helpful, and the subway system was much more intuitive to a beginner than the Chicago Metro. There are only 4 major lines that are color and number coordinated. We needed to take the #1 Orange line towards Songdo Beach. It was also nice that we did not have to figure out which direction to take, since the bus terminal is the end of the line for the #1 train. 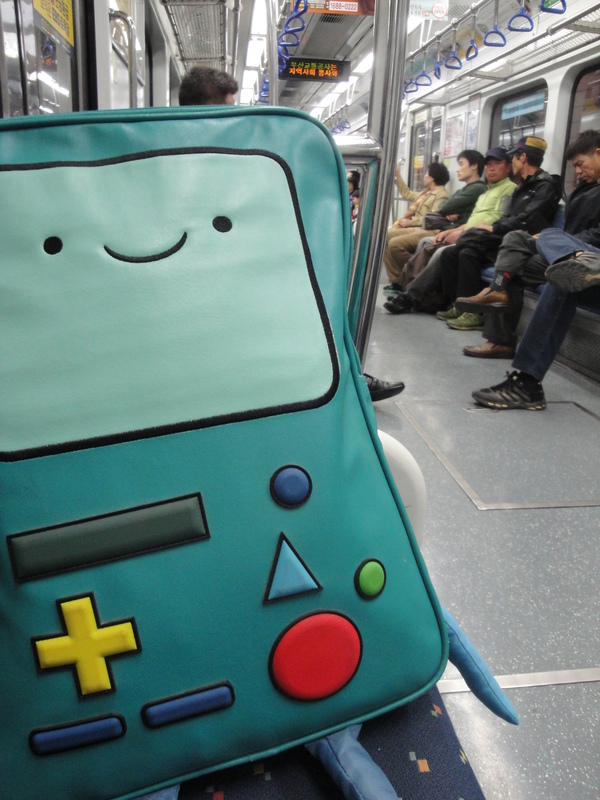 BMO’s first trip on the subway! 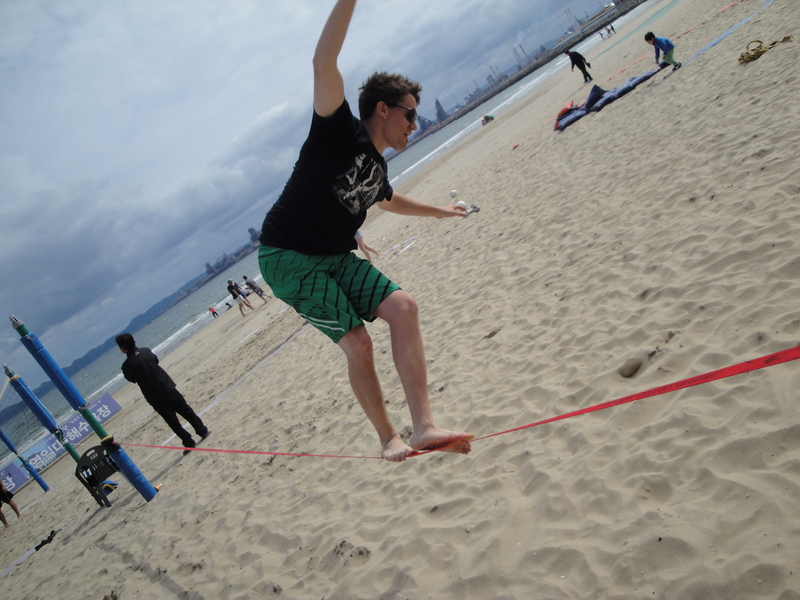 The closest we could get to Songdo Beach by subway was the Jagalchi Market exit, which took about 30 minutes to get to. 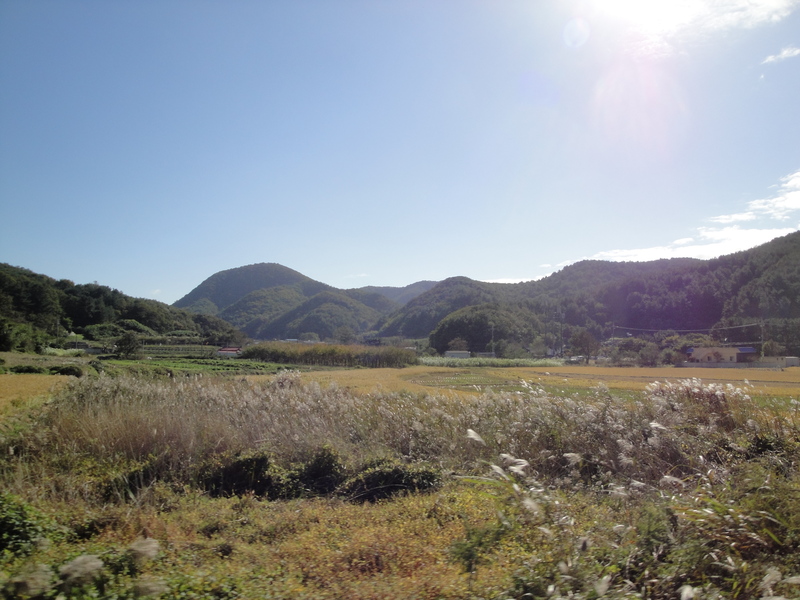 This was more than acceptable to us, because the market was recommended to us by Korean and foreign friends, so we started our sightseeing there. Much like our own market in Pohang, the food stalls, produce stands, and knockoff clothes seem to be never ending. 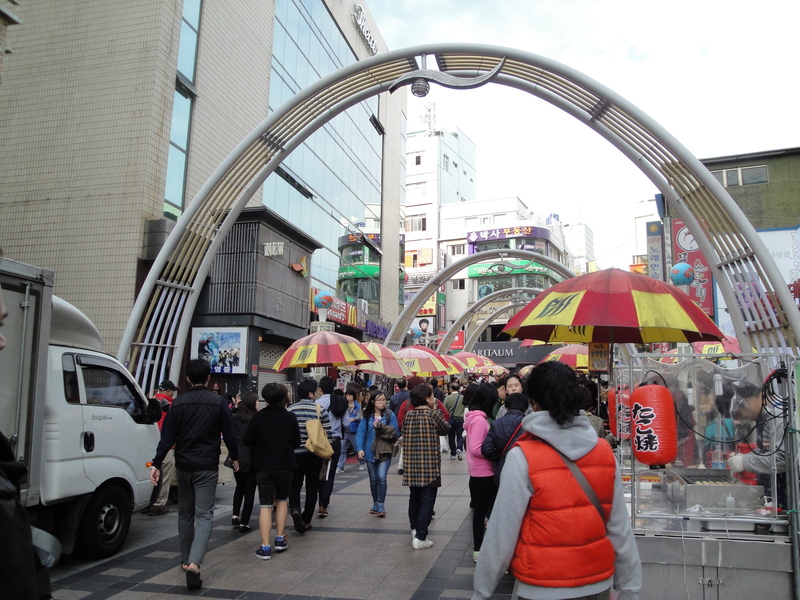 However, unlike our small city, this market in Korea’s second largest city seemed to contain a lot more Zazz (short for pizzazz, to quote Metalocalypse). We looked at some clothing, which seemed to be of a slightly better quality than Pohang’s selection, but did not buy any souvenirs this time. 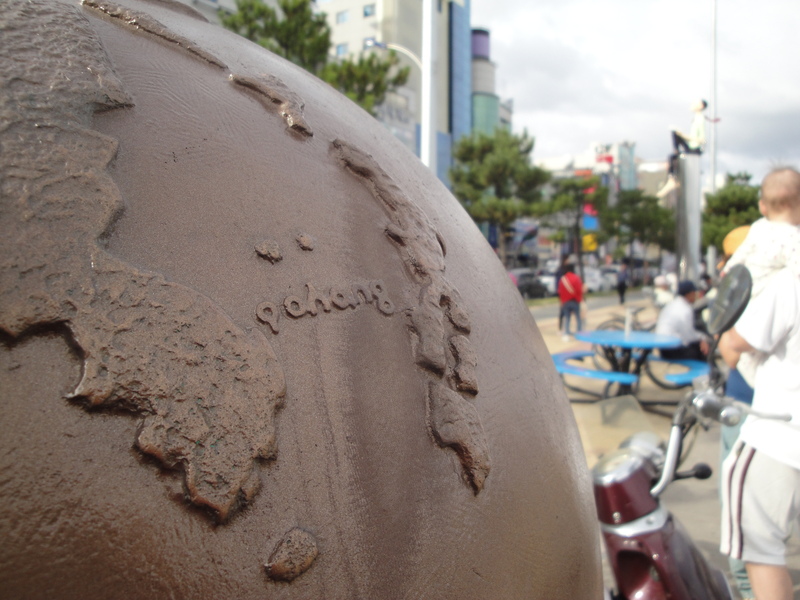 We stopped in a café for a short rest so that I could study the map and plan our route to Songdo beach. The beach was past one of the three bridges that cross Busan’s ports, and because we were feeling frugal we decided to walk rather than take a bus or a taxi. This decision was the wrong one for two main reasons. 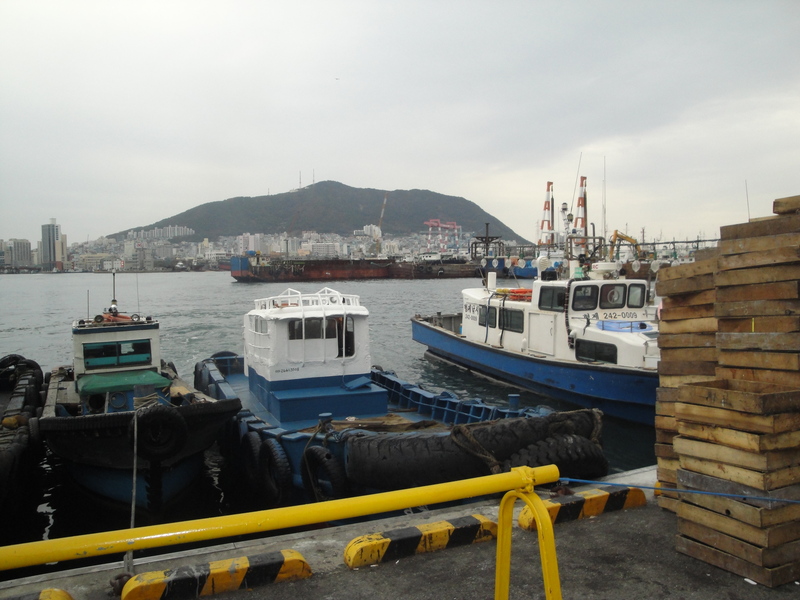 First of all, in order to find the bridge so that I could walk in the correct direction, we left from the Jagalchi goods market and crossed the street into the Jagalchi fish market, which is in a harbor looking out towards the bridge. As soon as we set foot under the steel canopy of the fresh fish market, the nauseating smell hit me right in the gut. Christina and I have been around fresh and dry fish every since we reached Pohang, so I am not sure what is to blame for the overpowering scent of this particular market. Maybe it was the quantity, maybe it was the harbor next to the market, or maybe the fish forgot to wash up that morning and just went on swimming without being considerate to the people catching them, but whatever it was it was quite fowl. We trudged on through the miasma of rotting fish and continued to follow the cement dock toward the bridge. 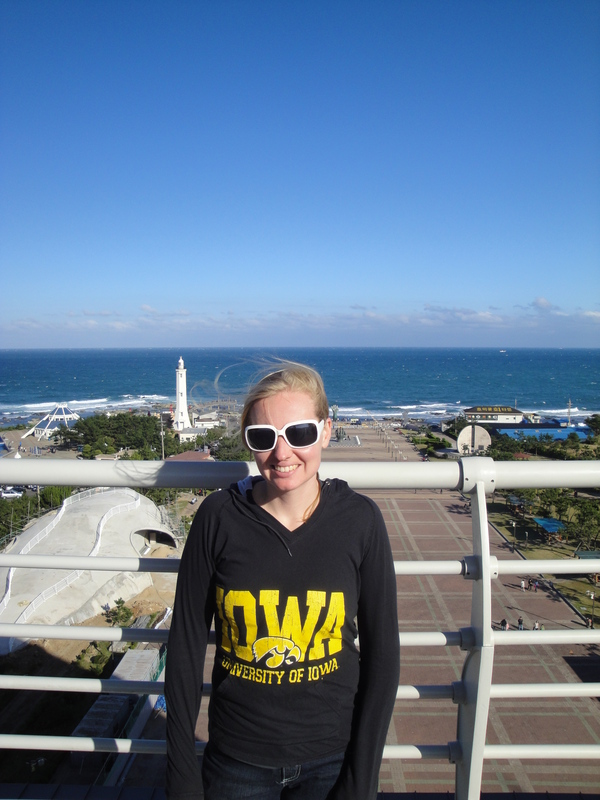 It was here that Christina and I felt more out of place than we had previously felt in Korea. This area was strictly populated by fishermen, their wives, and the mostly old men and women who were shopping in the area or working at the market. I did not see a single person my age, let alone someone who was not Korean. 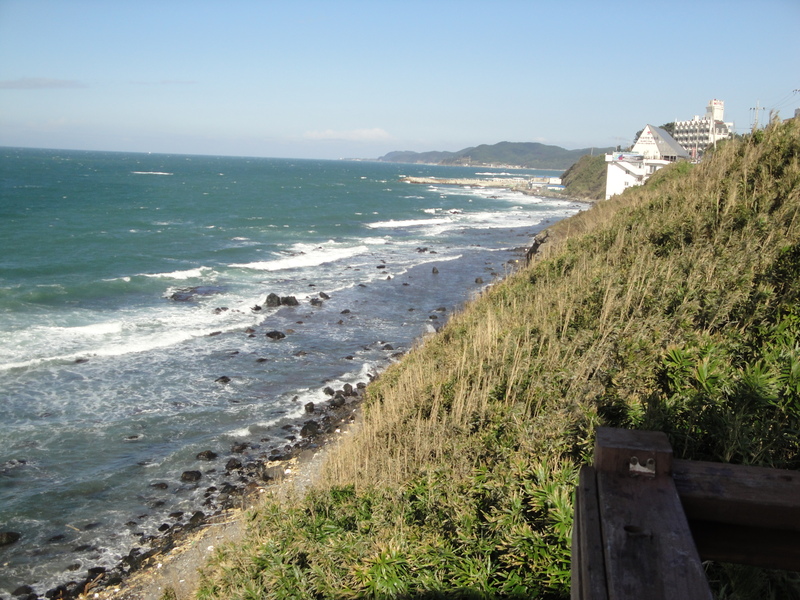 The second reason walking was a bad idea was because the beach was many kilometers away. Usually this is not such a big deal, but my knee was very sore from overuse, playing all the sports that I have become part of my schedule. 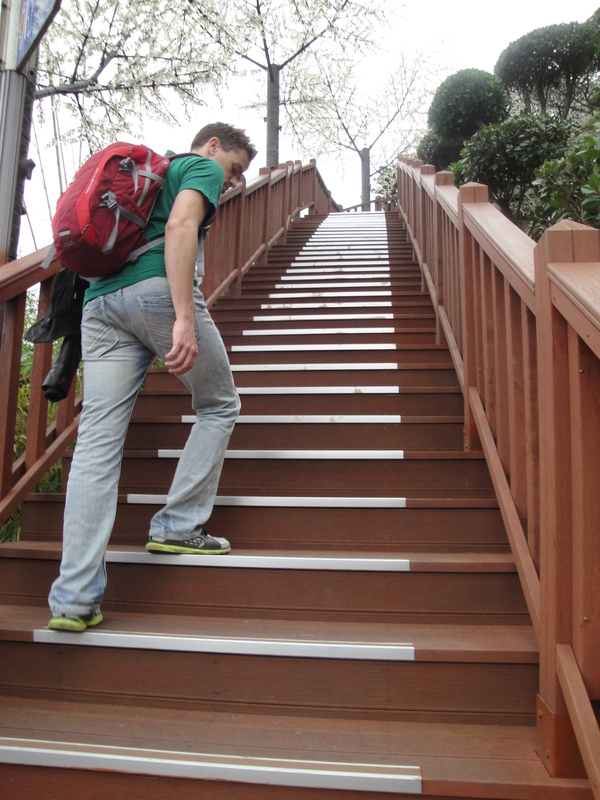 When we finally reached the Songdo area, my strides were becoming quite labored. 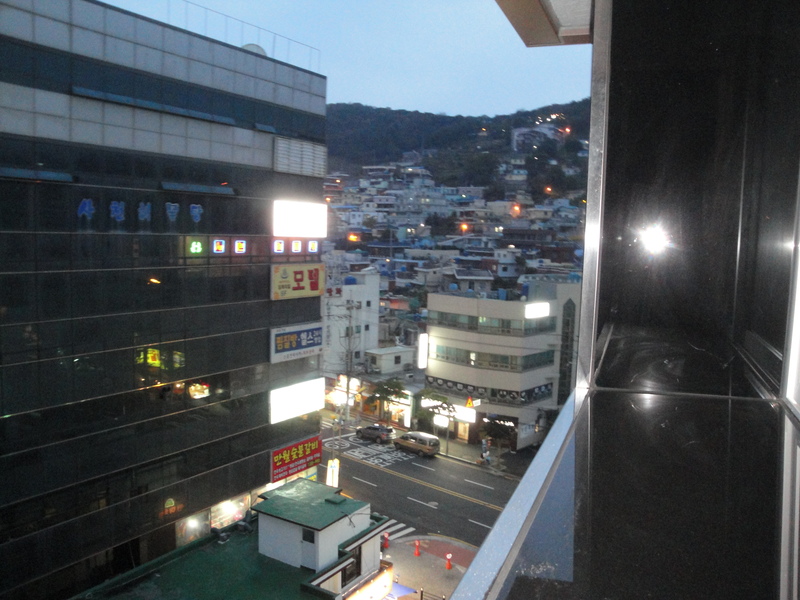 After we passed the bridge, we walked off the street and down a hill towards some funny looking motels. One was boastfully called “Hotel 2 Heaven” and another was shaped like a skinnier version of a Renaissance fair castle, complete with flags and ramparts. I chose to take this road because I noticed a staircase in the distance that seemed to lead into a forested area. 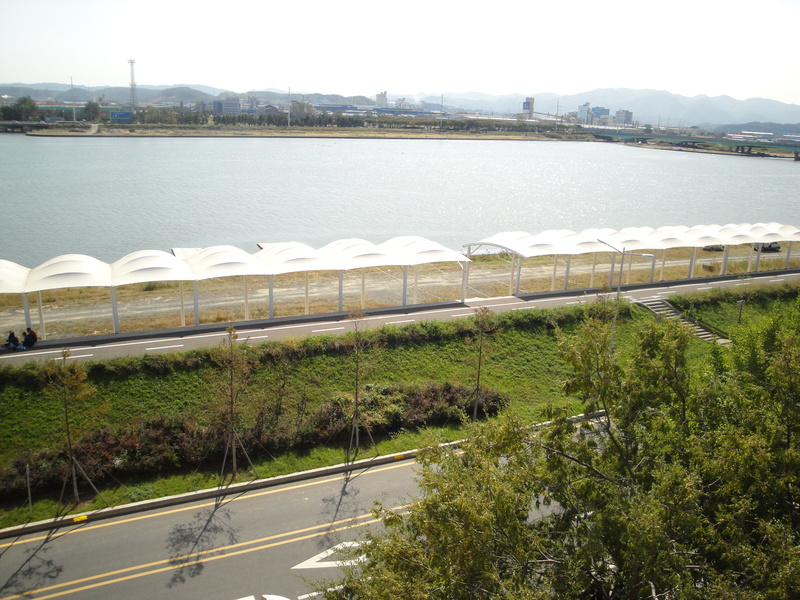 I had noticed a park called Songrem Park that was just before Songdo Beach, and I hoped that the staircase led to there. My guess was correct, and the park was nothing like I expected. I was looking for some wooded trails with descriptions about the flowers and trees of the area, but what I got was better. When we reached the top of the stairs, which were lined with benches facing the water and lighted plastic trees, we were greeted by a round garden in front of a pagoda. The pagoda did not seem ancient by any means; I doubt it could be more than ten years since it was built. 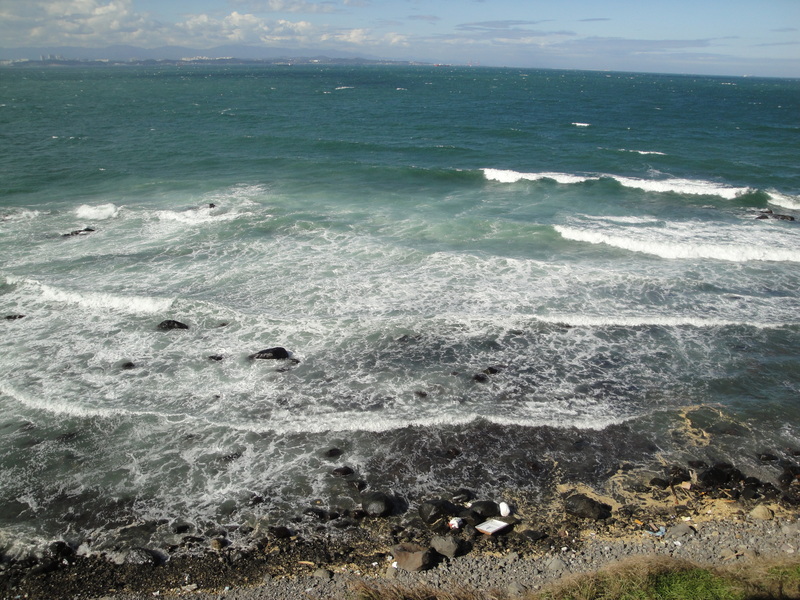 That said it made for a nice picturesque seen with the sea in the background. 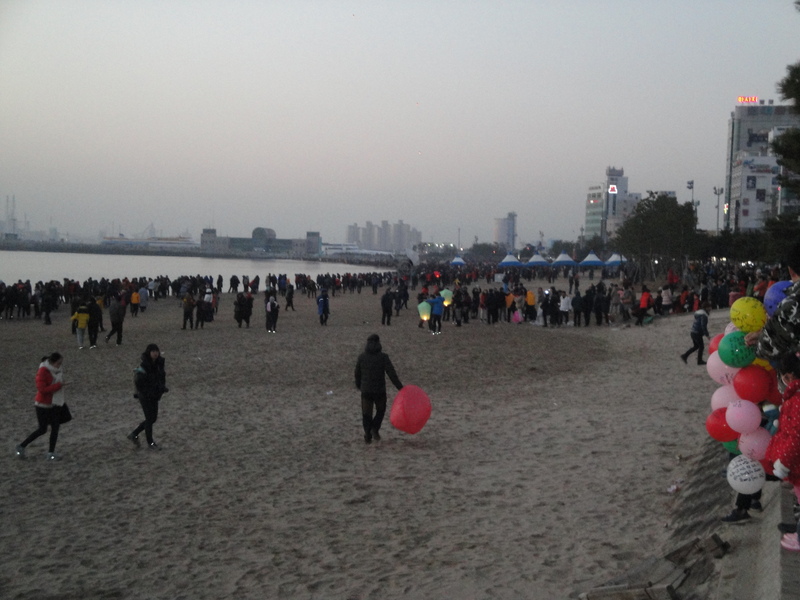 The park also had a large clearing where the entire Songdo area could be seen. In the clearing was a tiny glass cube that served as a library. 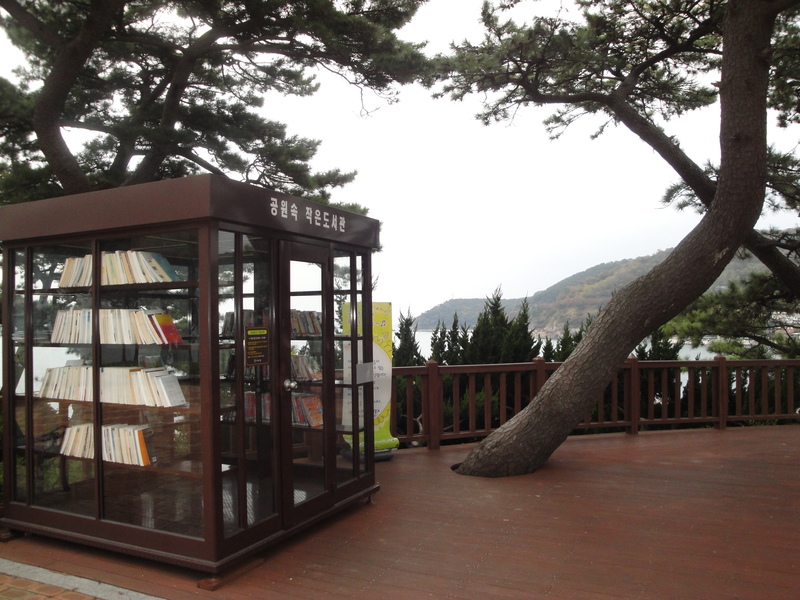 As a testament to the low crime in South Korea, the library has no attendant, it is just open for people to take a book, read with a view, and then put the book back when you are done. The park also had an “engagement spot” bench, where spotlights and a large neon lit heart combine to make excessively cheesy proposal opportunities. There was a musical fountain (that sadly was not running during November), a public restroom that was made to look like a pirate ship, and the token exercise machines that you find in most Korean parks. The elliptical and abdominal twisting machines were actually generators. Using the machine lights up the display, and if you plug your smart phone into the display the energy you generate fills the battery! We walked down the stairs from the park and headed towards a rock formation that stood out of the water like a tiny island. 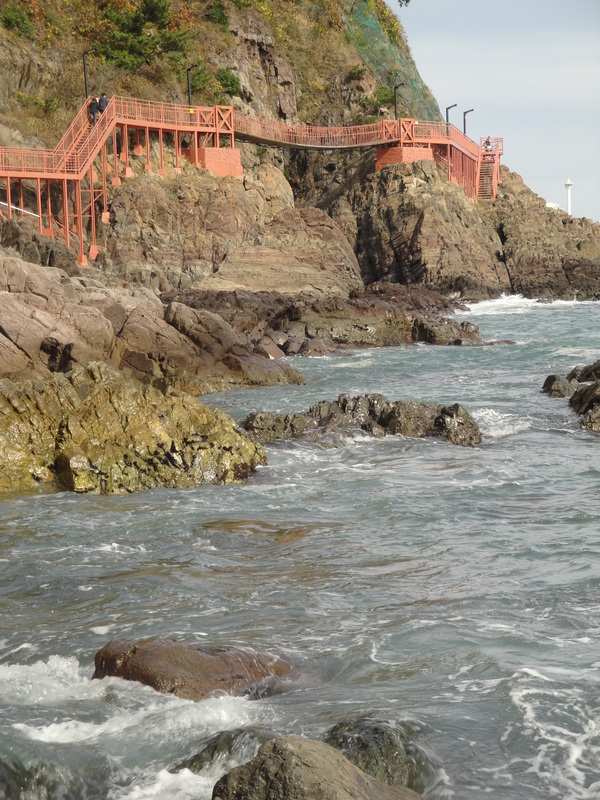 There were many other Koreans checking out the island, and a handful of them were fishing off of it. I believe this island was mostly artificial. The rocks seemed too perfectly smooth and proportional, and they didn’t feel like real rock to me. I imagine that a sandbar must have existed there already, but without a doubt, not all the rock there was real. 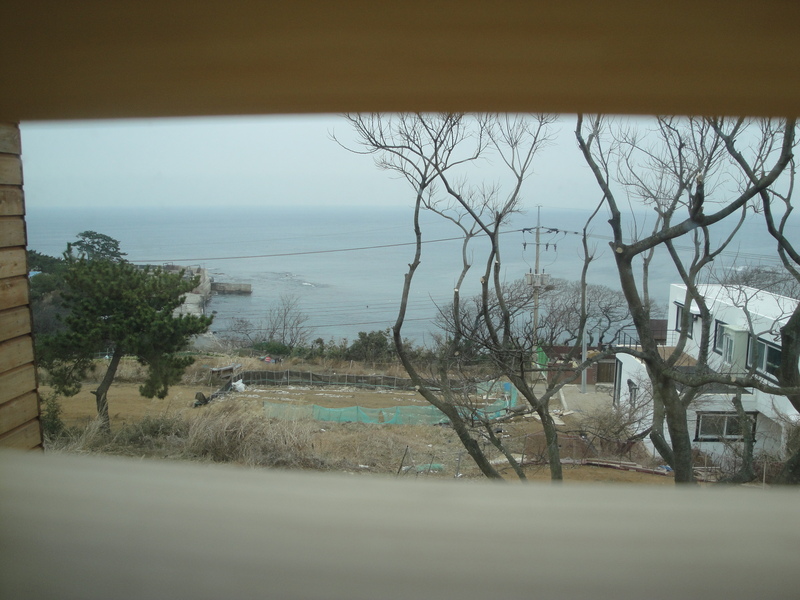 Nevertheless, it made for a nice view of the sea and the city. 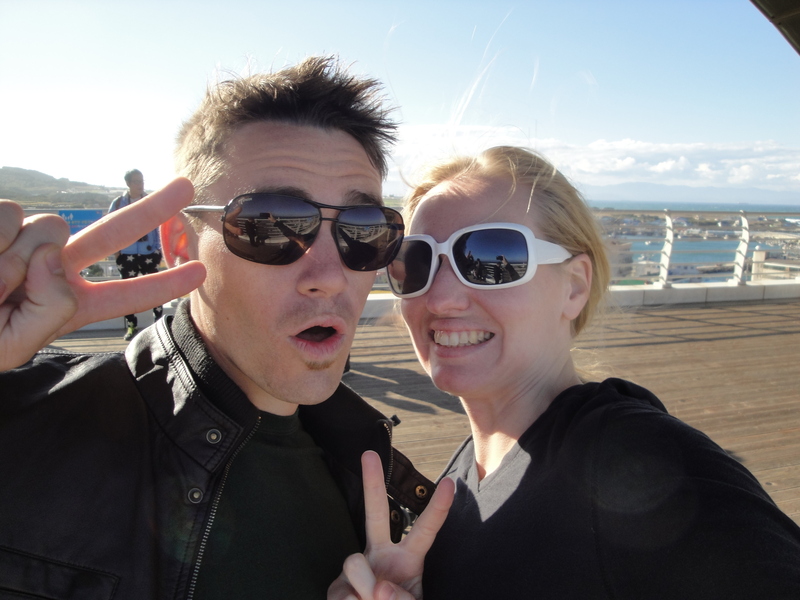 We escaped from The Rock and headed toward the beach and the Port Lighting Festival. 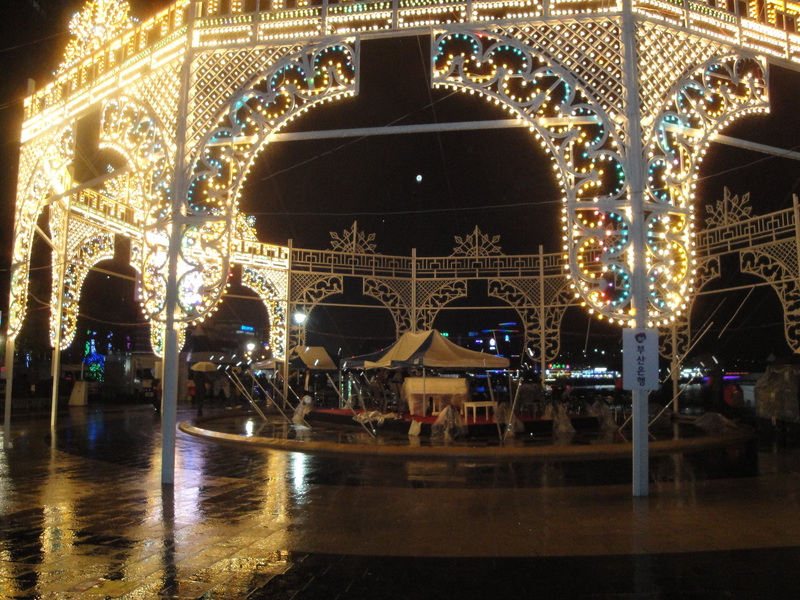 There was still daylight when we walked on the boardwalk, so the bright lights were not switched on yet. We knew that there would be a “festival” side to the event, but we were surprised to find that it was an international festival. There were many booths along the boardwalk that features different foods, knick-knacks, and customs of foreign countries. Among those represented were India, Vietnam, Turkey, and tribes of Native Americans. 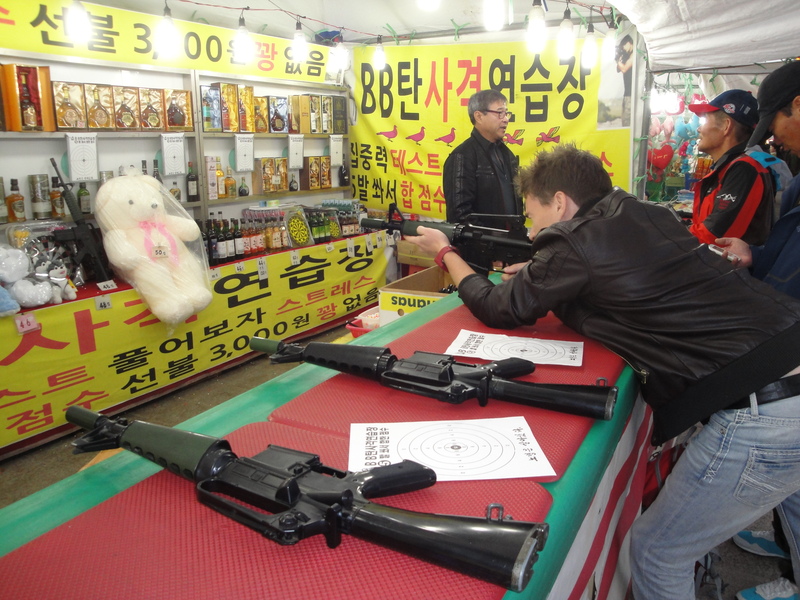 There were a few carnival style games set-up as well, and I attempted to win a bottle of whiskey by shooting a paper target with an M-16 inspired pellet gun. I did not score high enough to win alcohol, but I think the language barrier held me back from total victory. There was a giant outdoor gazebo that was strung up with many lights, and the many music stands and white grand piano made me think that a band would play later in the evening. 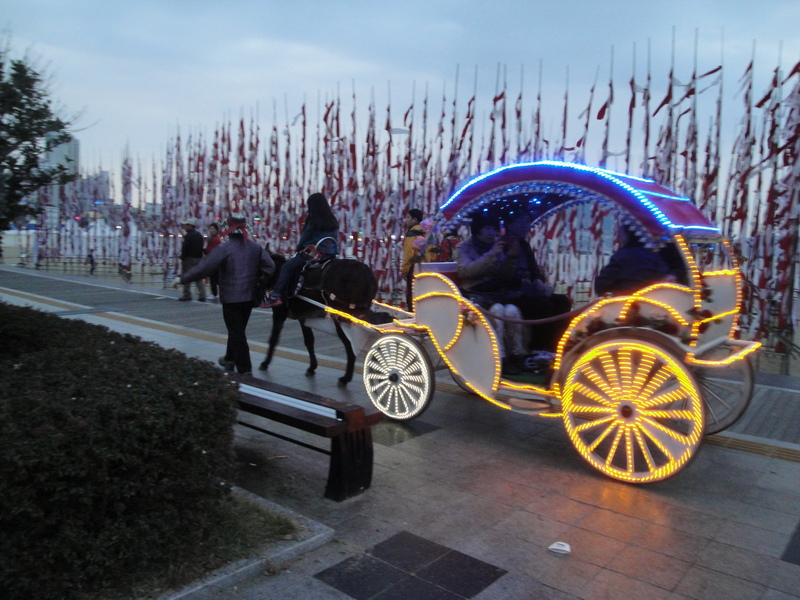 Past the gazebo were some light decorated sculptures and carriage rides with lighted seats, pulled by donkeys instead of horses. 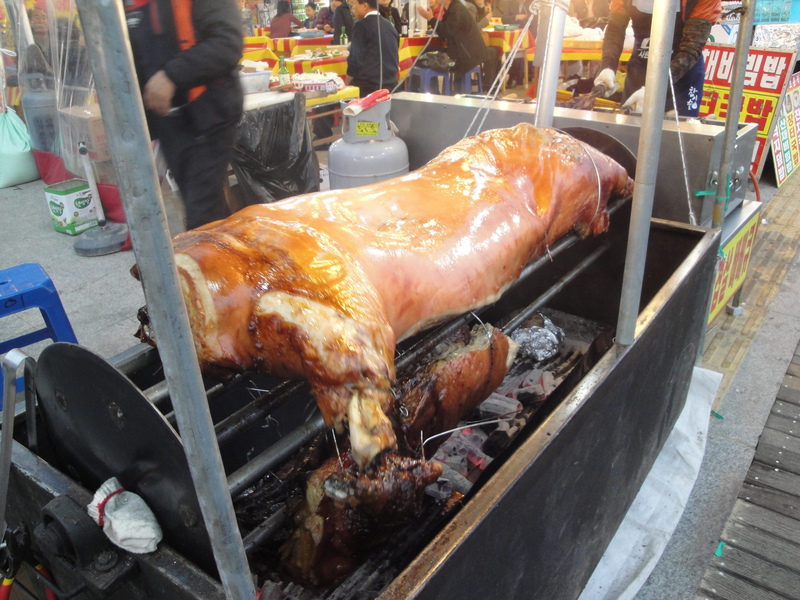 My favorite sight was the large rotisserie near the middle of the food tents, where a whole pig had been split in half and was roasting succulently. Due to our tired feet, my swelling knee tendons, and the tiny drops of rain falling on us we decided it was time to find lodging for the evening. 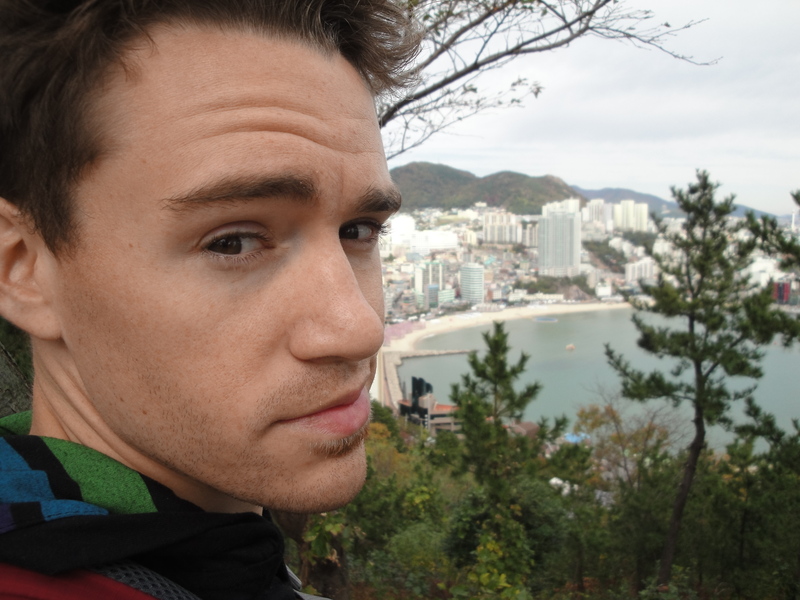 We knew that the many motels in Korea cost around $50 a night, but that some have a reputation for being sleazy and dirty. I did not feel like sleeping in my clothes and worrying about getting ill from a bathtub, so we decided to try for one of the hotels listed in the tourist map. 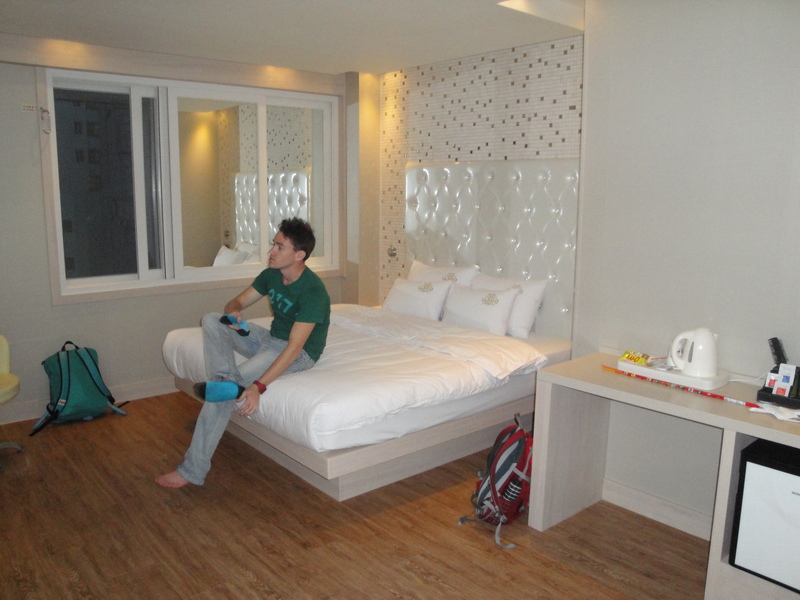 The first one we went to was a beach front hotel appropriately named the Songdo Beach Hotel. 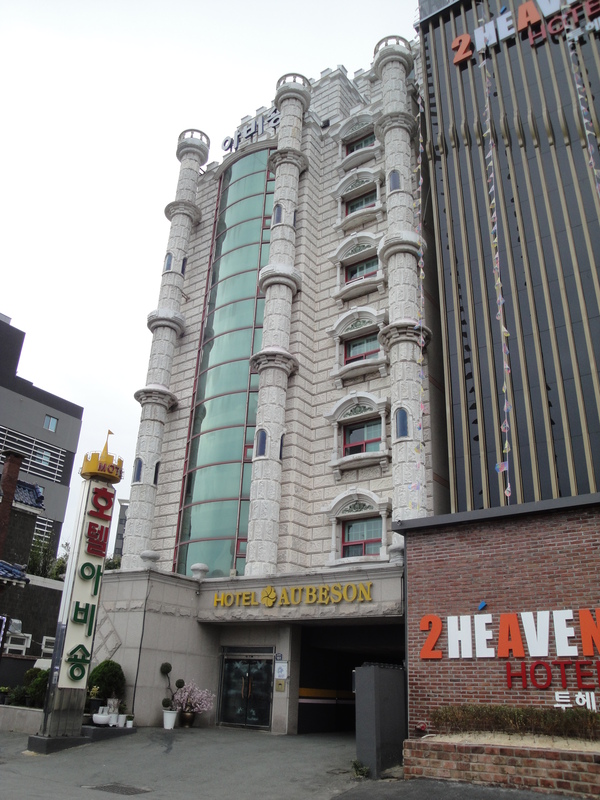 It looked very elegant and had an American style restaurant on the top floor, but it was priced at 120,000\ a night. We left the hotel, worried that the festival was making the hotels unaffordable to such cheapskates like Christina and me. There was one other hotel on the map, just a block away from the beach. 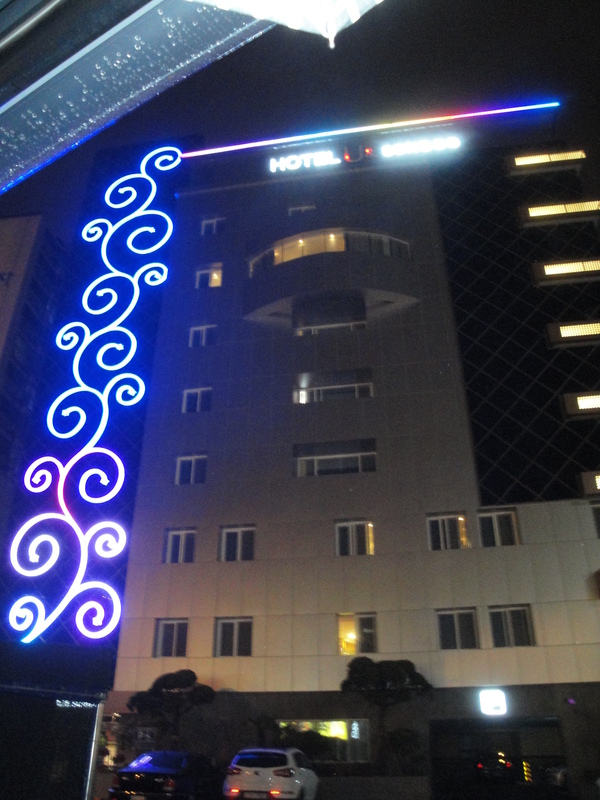 I didn’t even know that I was looking at the same hotel as the map indicated when I laid eyes on the U 3-5-8 Hotel, but I was drawn in, like a moth to the color-changing wall of light that was build into the façade. We walked inside the small lobby and asked the clerk the price for a night. It was 70,000\. 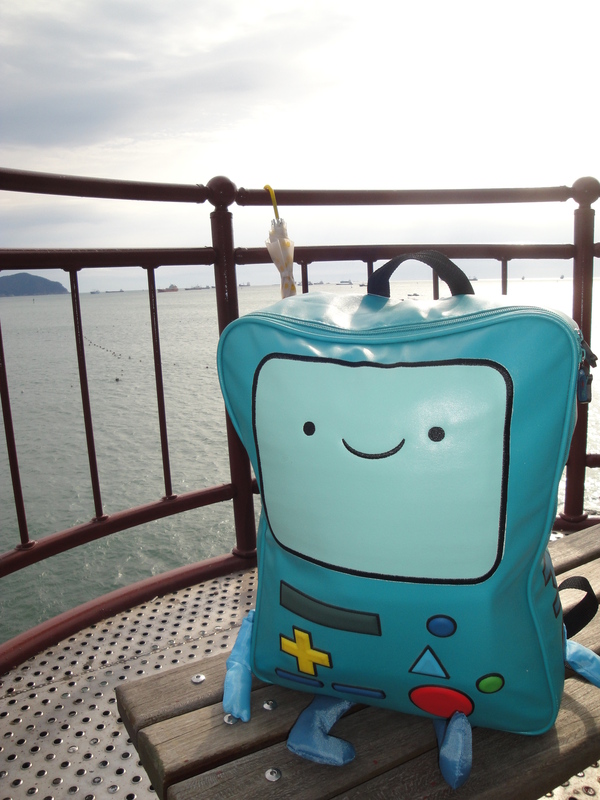 It was still more than I intended to spend when we left Pohang, but we agreed to the price anyway. Finally we could get an hour of rest. As unassuming as the lobby was, I did not have many expectations for the room itself. Really all I wanted was a working bathroom with a clean bed. 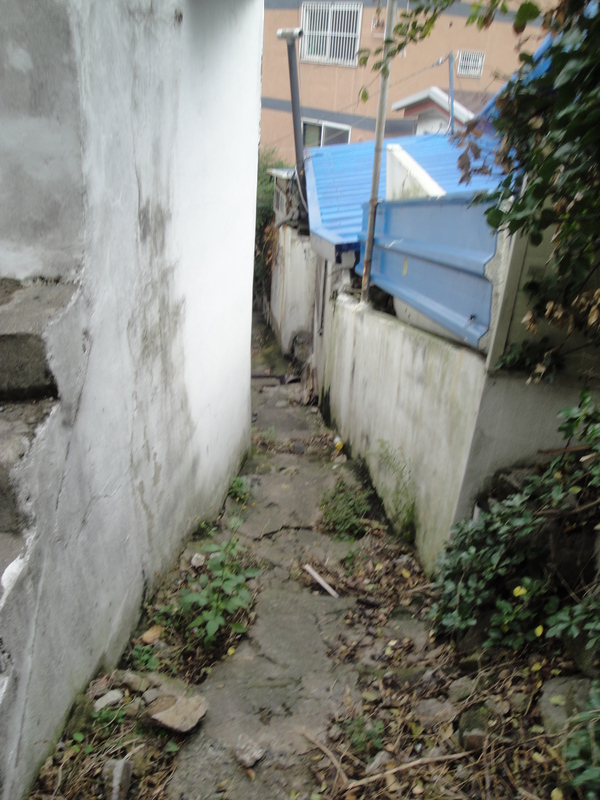 When we swiped our card to enter the room, we were met with the expected shoe room that is traditional in all Korean dwellings, but past that room there was only darkness. 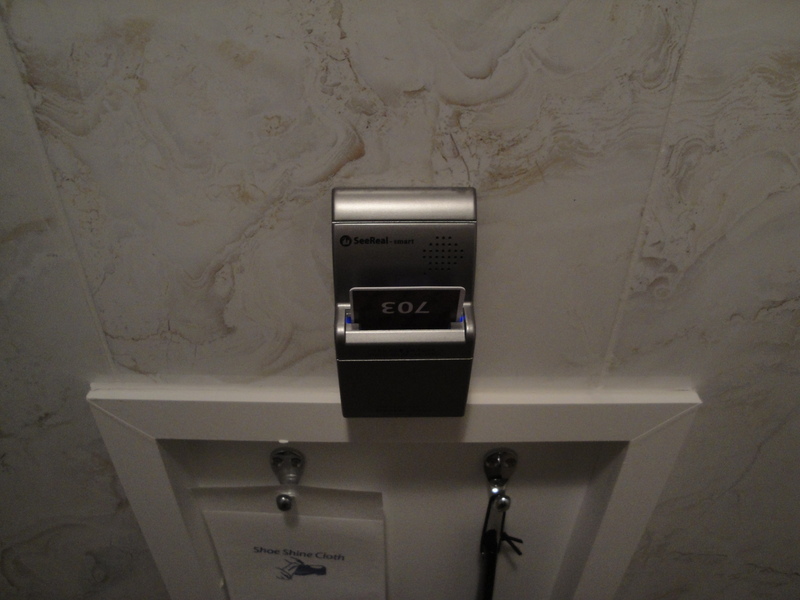 There was a dim blue light coming out of a device in the middle of the shoe room wall, and I noticed that it was the same size as the slot that we swiped the card to enter the room. I figured it was a convenient place to put the card key so that I didn’t lose it in the room, so I complied and slipped the key in. Once the key touched the bottom, the room lit up, revealing hard wood floors, beautiful white leather dining chairs around a small table, a fresh king sized bed, a large flat screen TV (that also turned itself on when I inserted the card), a desktop computer, a bar with a coffee machine, and a large 7th floor window that faced the sea. Needless to say we were blown away. A wall mounted display near the bed controlled the seven different light sources and it controlled the air conditioner. The bathroom held more surprises: a huge rainfall shower head, a whirlpool bathtub, and a toilet with beday (also much more common in South Korea than America). 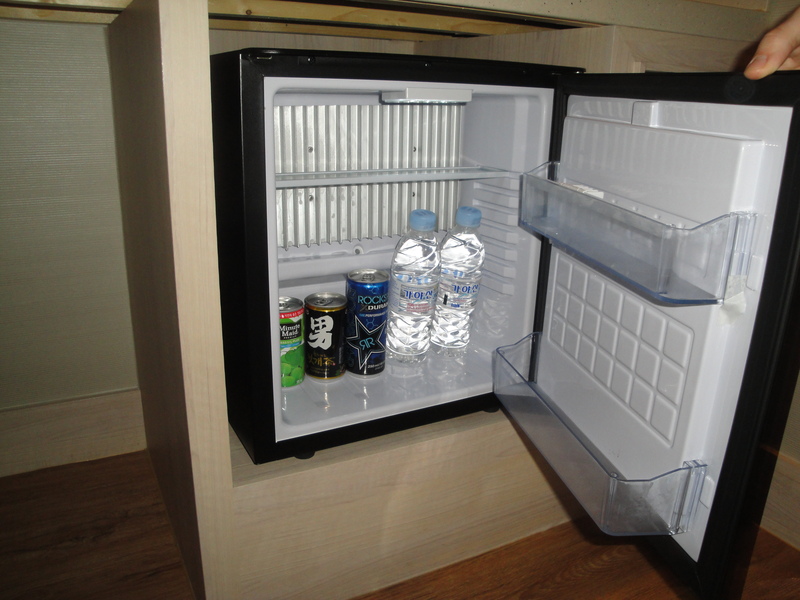 A refrigerator under the bar held bottled waters and juice cans, and on top of the counter were welcoming gifts of necessary toiletries, lotions, robes, snacks, and instant coffee. 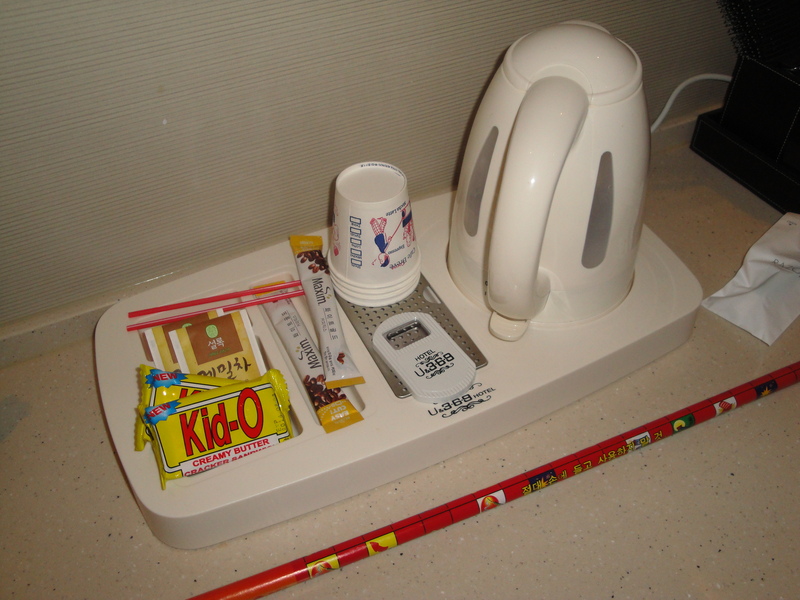 Another nice feature of the Korean hotel is that you pay for your room as soon as you check in, so using the items in the mini-bar are already included in the price. Our rest in the hotel room was interrupted by the thunderous explosions of the festival firework show beginning. We were completely surprised, considering there was still a small amount of daylight left and it was only 6:30 in the evening, and who starts a fireworks show that early? We tried to watch out the window, but our view was almost totally blocked by a large apartment complex. We wanted to see the show, so we put our jackets and shoes on quickly and raced out the door. By the time we reached the beach, the show had already ended, but since we were already outside we decided to figure out what to do for dinner. Kevin won this Roman candle from the gun shooting game. We had a little fun before the downpour. Mere minutes after walking back towards the International Festival; we realized that the promise of fireworks was actually an elaborate plot to make us wet and miserable. The fireworks likely started so early because the event coordinators must have known that they would not get a chance to use them later in the night, because just before 7pm it started raining a noticeable amount. By 7:15pm, we were in the middle of a torrential downpour. People were still out and about though, even in the rain. 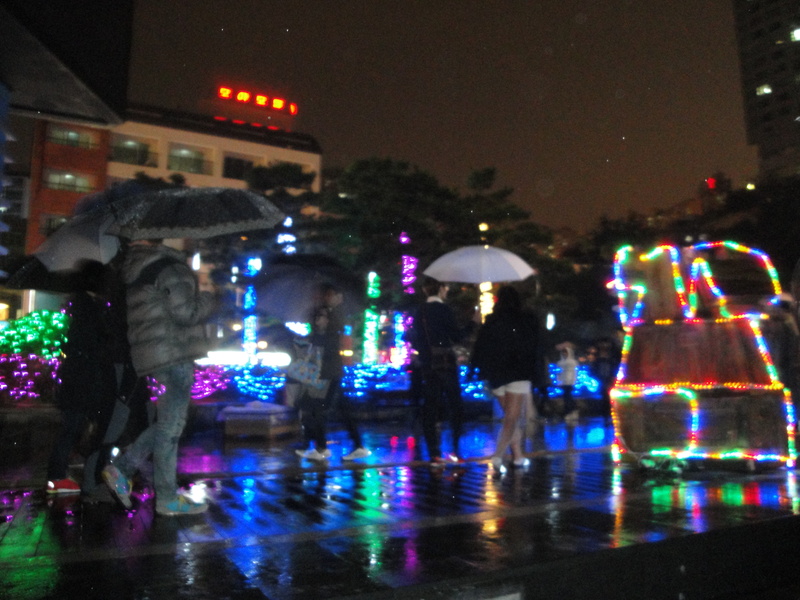 The rain that we felt was the same typhoon that caused the horrible amount of destruction in the Philippines, and while the effects on Busan pale in comparison to the disaster that happened to that island nation, the backlash of that storm was no light sprinkling. Despite having umbrellas, our clothes were thoroughly soaked. Walking uphill meant walking through a small waterfall. Our slight misery was compounded by a fruitless search for crab (we couldn’t find any near the beach in the largest coastal city, WHAT GIVES!?) that lead us to one side of the beach and back to the other. We actually made it all the way back to our hotel without seeing any light displays, fireworks, or finding a dinner option we could agree on. We settled for having some spicy cheesy chicken at a bar near the hotel, and then we ran back to the hotel to put on dry clothes. The forecast for Sunday called for more rain in the before noon, so we wanted to get an early start on some hiking in the morning. 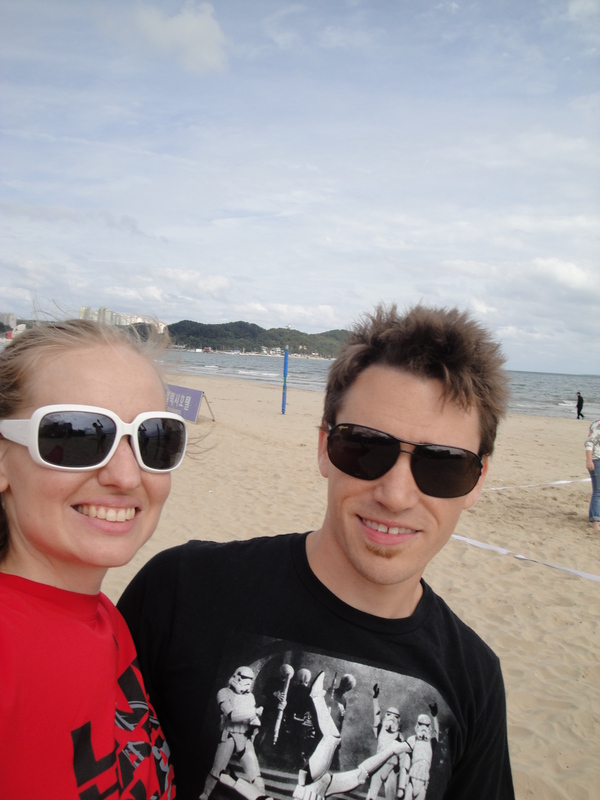 Also, I had a soccer game to play in Pohang that evening so we had to leave Busan by about 4pm at the latest. With these things in mind, Christina and I were packed and out of the hotel at an early time for us, 9:30am. 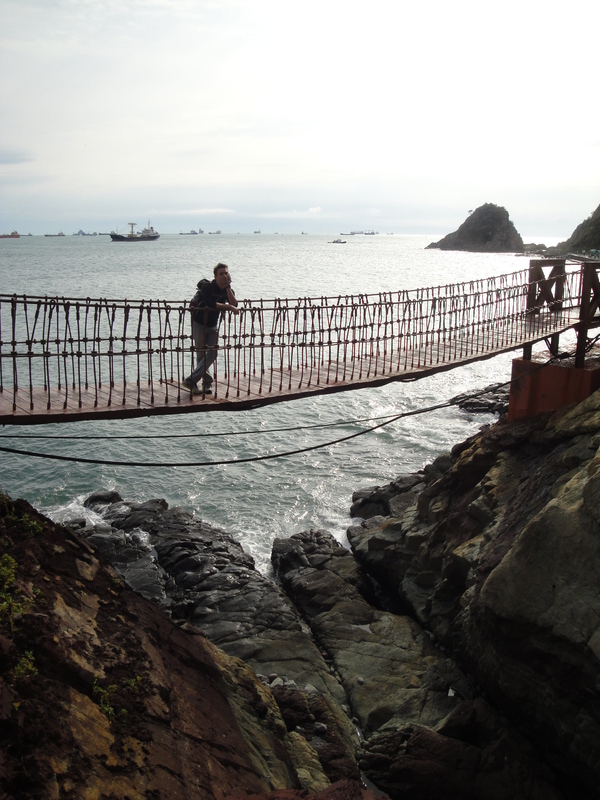 My map listed another interesting area at the far end of the beach; a hiking trail made mostly of catwalks and suspension bridges built into the sides of the mountains that touch the sea. It was a gorgeous path, and to our great fortune the rain didn’t come. 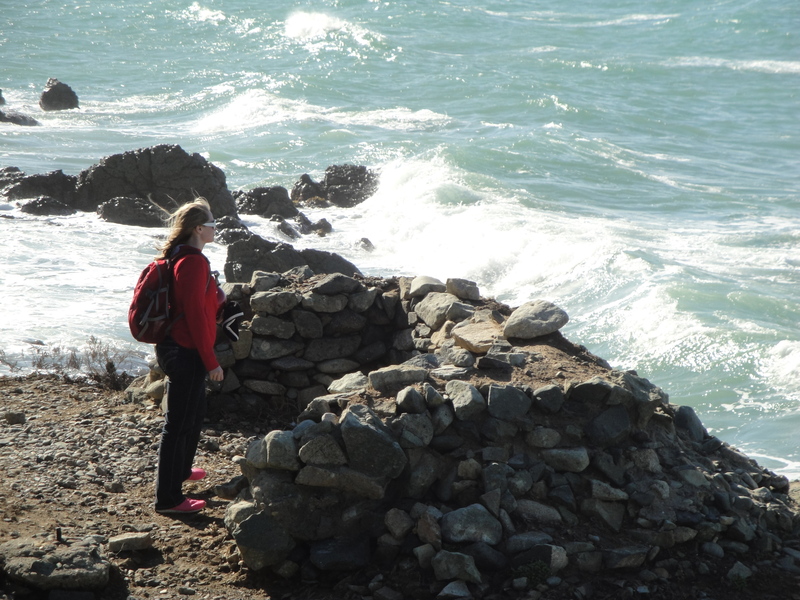 The trail of metal paths that stretched between rocky shores was a lot of fun to walk across. 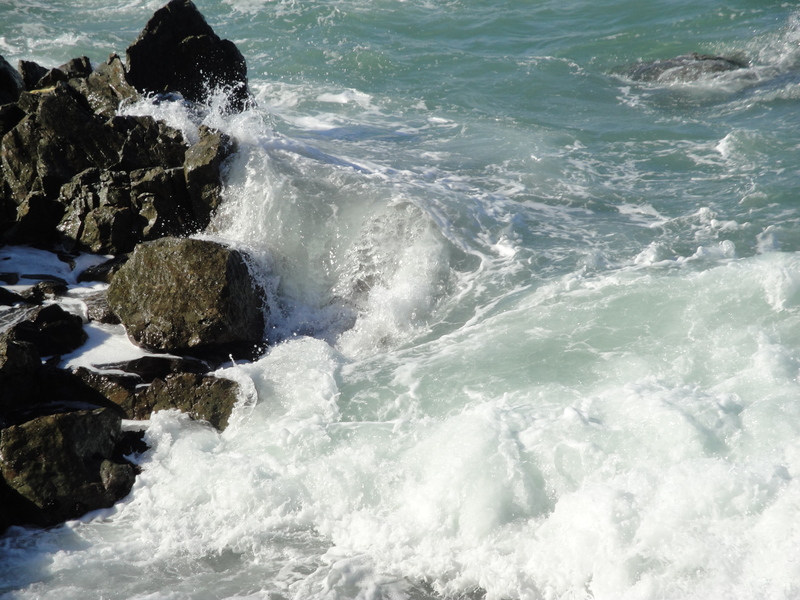 There were many scenic views of the sun, waves, and tankers in the sea, and the flat rock areas that jutted out from the catwalks always had at least one fisherman on them. 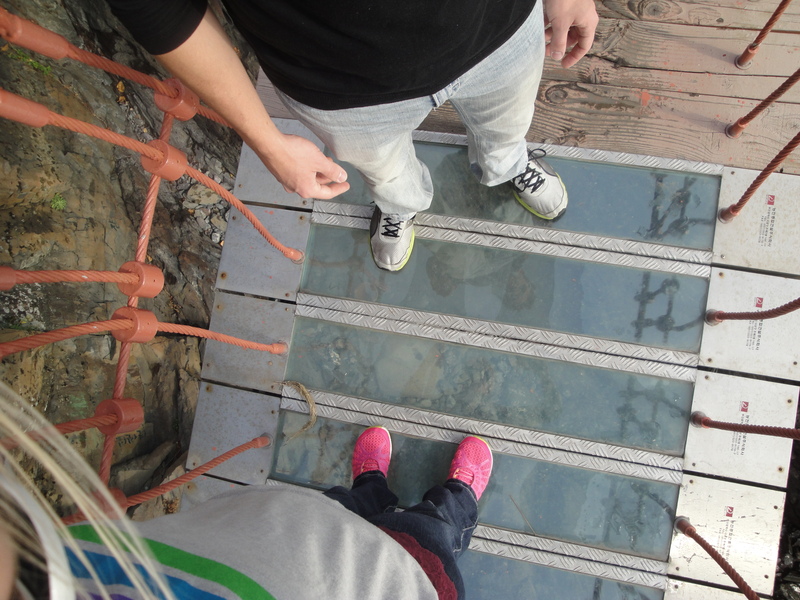 The suspension bridges were my favorite part of the hike, not only because they are awesome when a part of any hiking trail, but because the centers of the bridges were made of clear plastic, allowing a view of the waves crashing below the bridge. The hike was not particularly long (less than 2 miles I think), and at the end of the hike was a small fish market, complete with twenty or more people fishing from a parking area near the sea. We walked up the hill towards a main road, but instead of waiting for a bus at the bus stop we noticed another hiking trail that seemed to lead up the closest mountain. We had the energy and we knew the mountainous area was included in a different city park, so we started up the mountain instead. 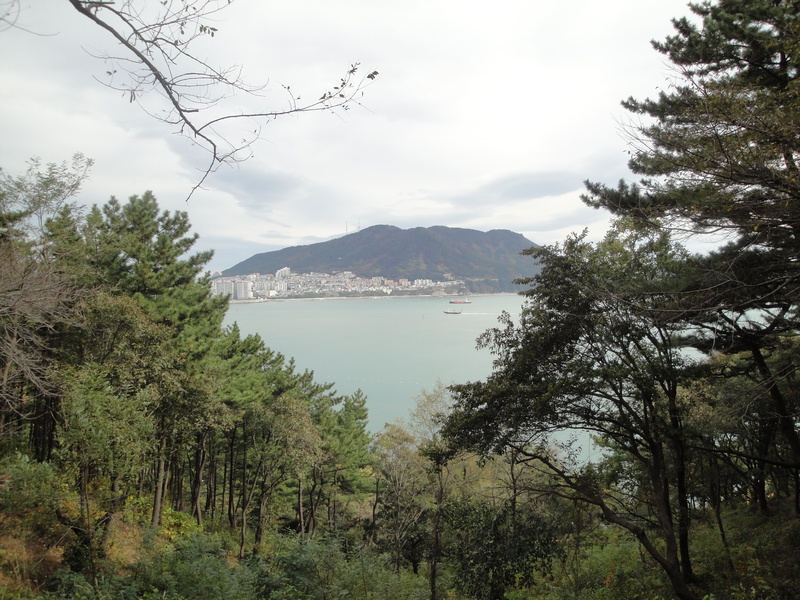 It was a very peaceful trek up a wooded hill that connected to two other small mountains. The views of the city and the sea were incredible. 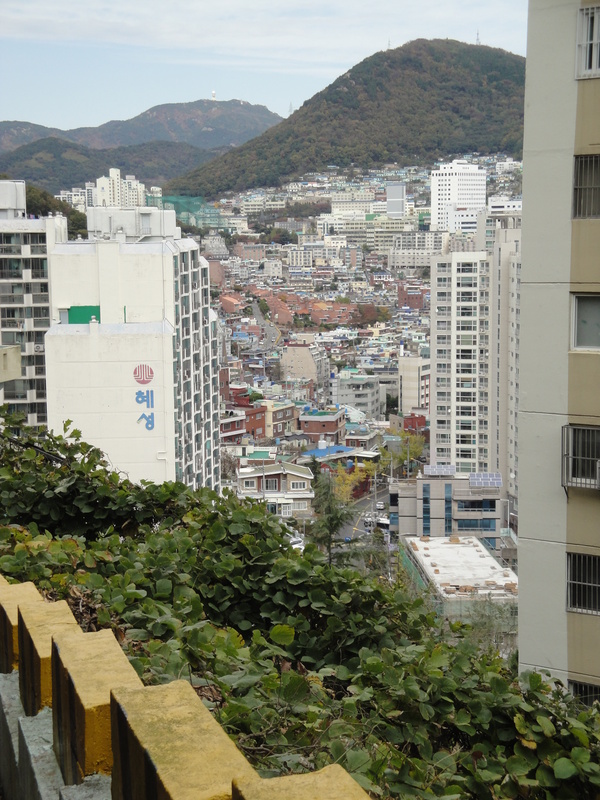 Conveniently, the trail led back towards the metropolitan Songdo Beach area, ending at a road high above most of the buildings. 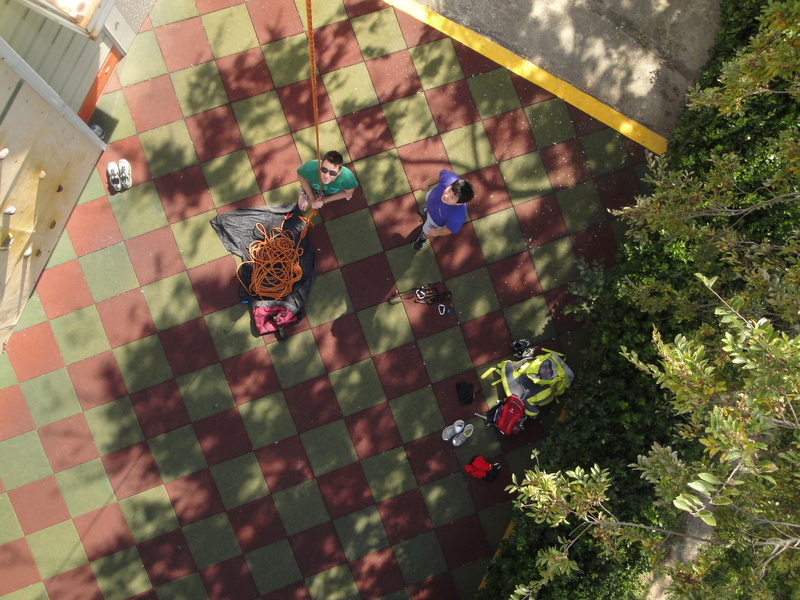 We walked down the road until we crossed over a cement bridge to an apartment rooftop. The apartment was constructed almost like a Mayan pyramid. 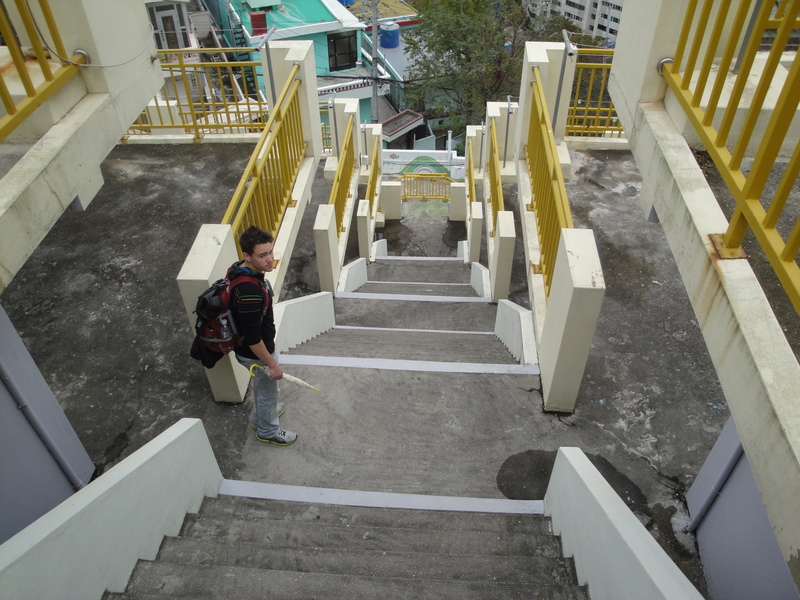 A steep staircase that ran down the middle split each level into a left-side apartment and a right-side apartment. We walked down the stairs and squeezed through some tight alleyways, and on the other side was a bus that was headed towards Jagalchi. During the bus ride back to Jagalchi Market, I felt like a certified foreign adventurer. I picked the best bus stop to get off, we had pajan (a Korean green onion pancake, which is delicious) and duk galbi for lunch, and we found the entrance to the subway without any issues. The only thing to worry about with the subway was making sure we got on going the correct direction, which we did. 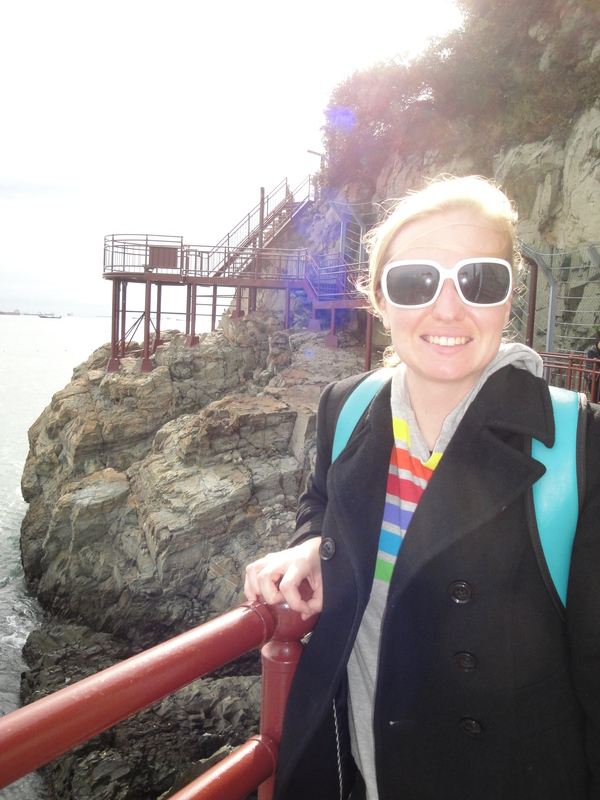 We made it back to Pohang with plenty of time to spare. All in all I felt it was a fantastic way to spend a weekend. It could have been better if not for my ruddy knee and for event cancelling storms, but besides that there was nothing else to really complain about. 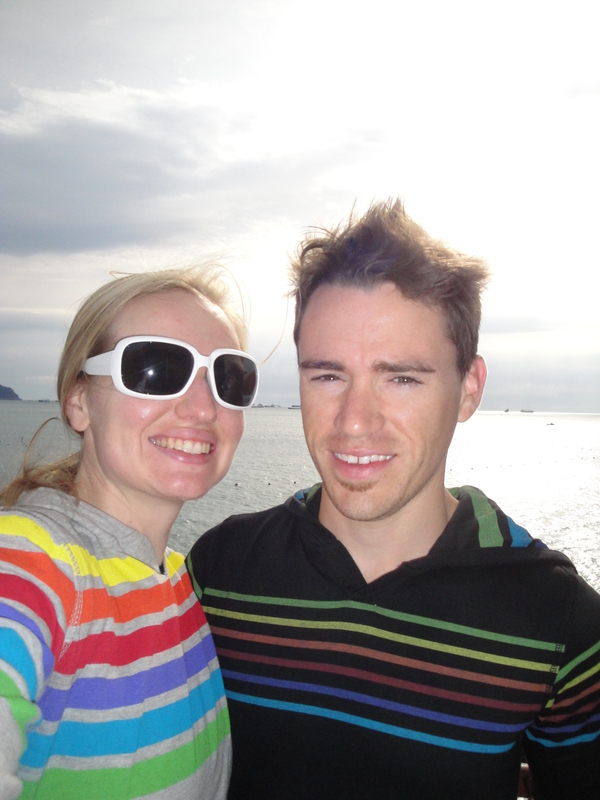 Christina and I really look forward to seeing Busan again, especially in the summertime when the beaches are packed and the nightlife is vibrant; but as for our first journey away from our new home, I’d say we did it right. This past weekend we hosted our very first couchsurfers! 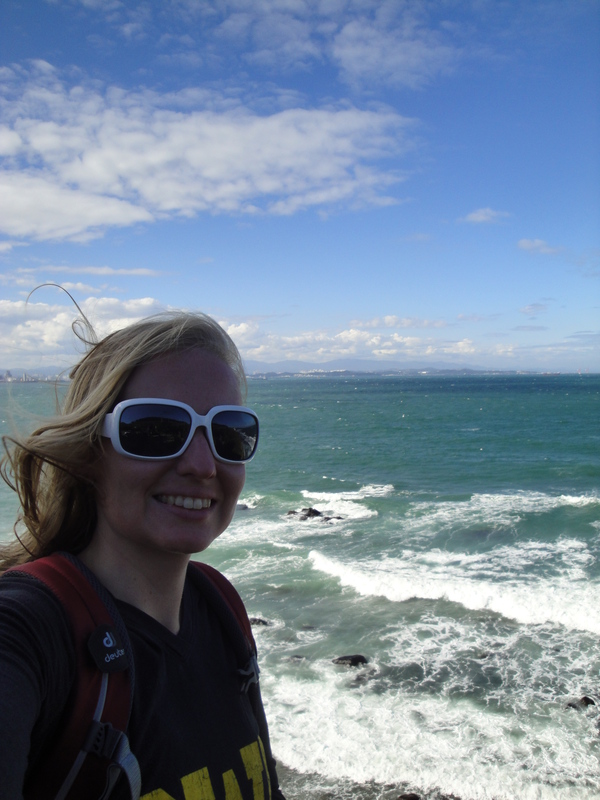 For those of you who do not know, couchsurfing.org is a site which allows a person to host or surf (stay) with people all over the world. I think it is an amazing idea and am very grateful that one of my friends introduced me to the site. It is kind of like getting a bed & breakfast plus tour guide to the city. 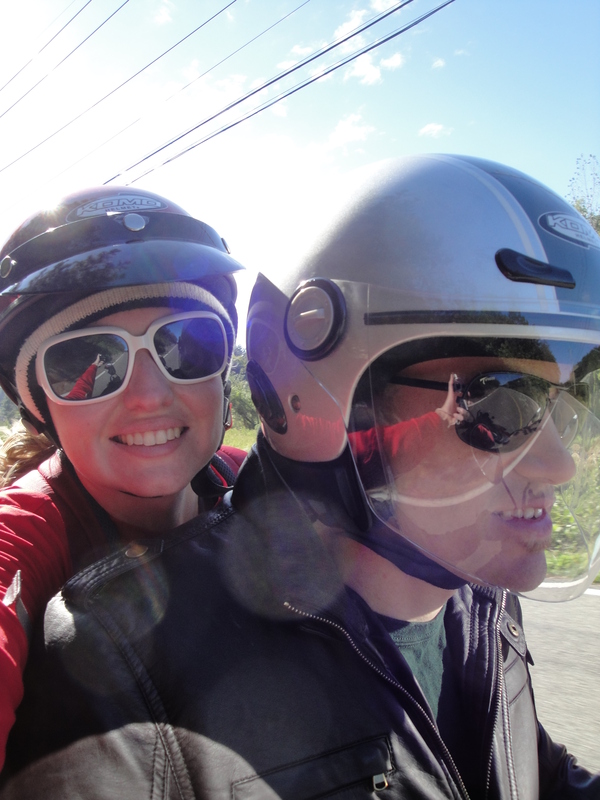 So anyhow, we hosted a couple from Poland who are tandem biking across Europe and Asia. Seems like a pretty amazing journey to me. I think they had been on the road for about 7 months and somewhere around 6,800 miles (about 11,000km). In case you were wondering, they did not bike through North Korea to get to South Korea. They took a ferry from China. Our guests stayed with us for two nights. The first night they joined us for dinner at a fancy Japanese Tuna restaurant (I say fancy because it was also expensive, haha). This restaurant serves mostly raw tuna from almost every part of the fish. My favorite was the sashimi style slices of fish with rice. “Fancier” parts of the fish included the marrow, cheeks, head and eyes (Kevin tried all of these, I only tried a few). 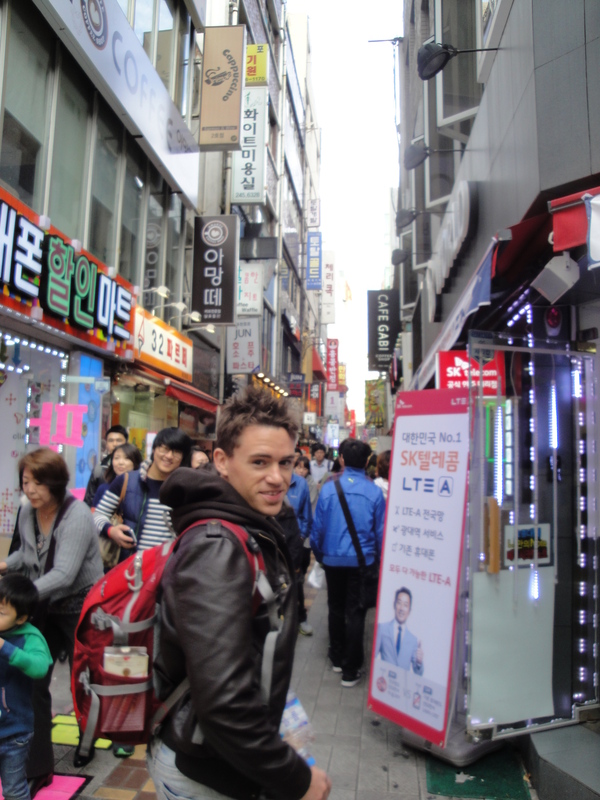 The second day we took our guests to the Jukdo market and stream street. 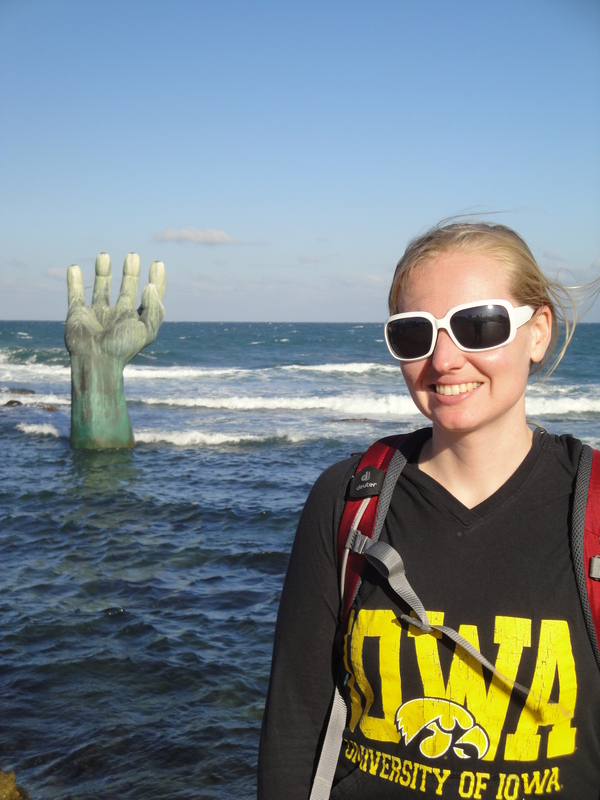 I have talked about these places in previous blog posts, but let me refresh your memory. 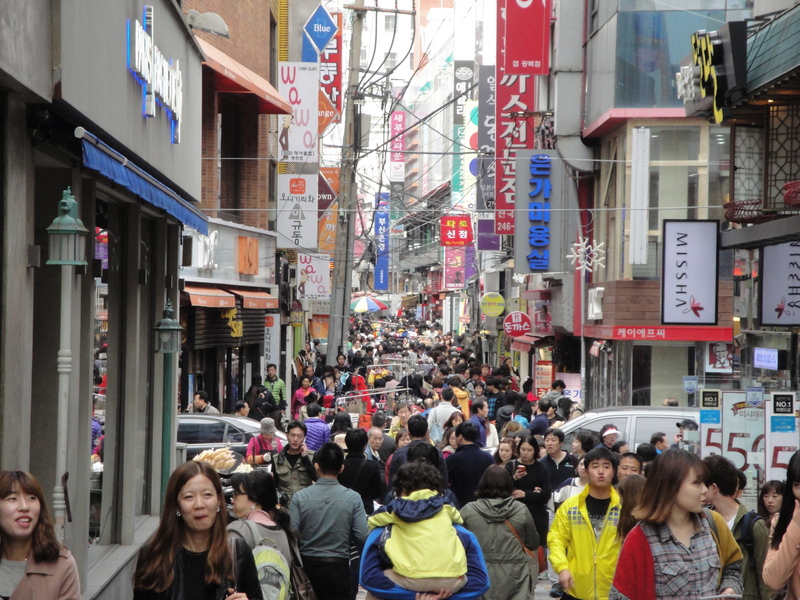 Stream street (as the foreigners call it), is a pedestrian mall lined with shopping venues and a few eating establishments. As you walk down this boardwalk-like street one can hear music blaring and mixing together. I am convinced this type of marketing is only slightly effective. The loud, fast music makes me want to buy things, but I also just want to get away from the club-like noise. 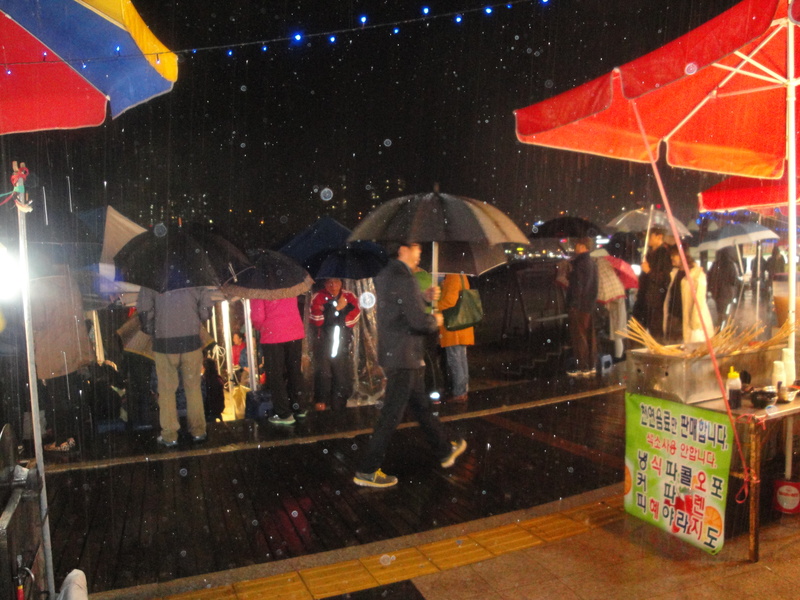 After we exited the day time club/pedestrian shopping area we headed over to Jukdo market. 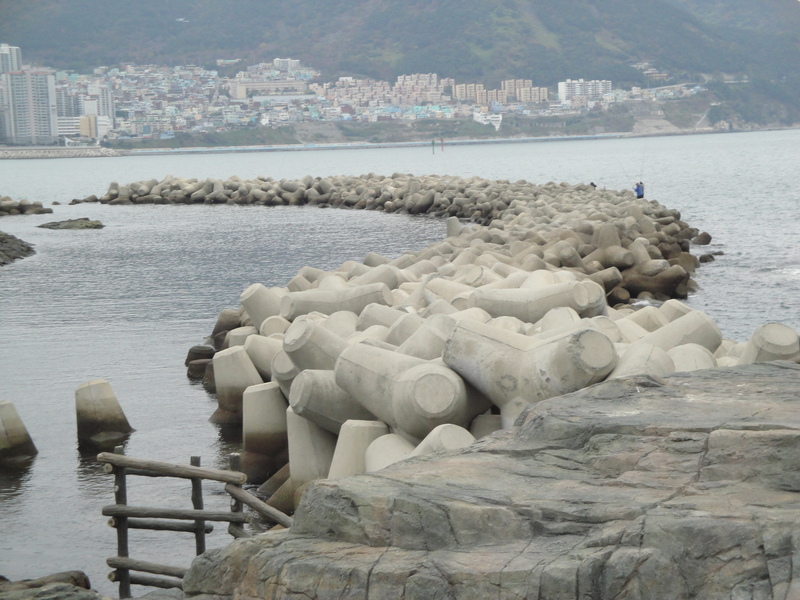 I doubt we will be able to see all of that market in the time we are in Pohang. The little temporary stands/shops go on forever. This visit we focused mostly on the fish district and saw a lot of live squids, fish, crabs, lobsters and even a sting ray! 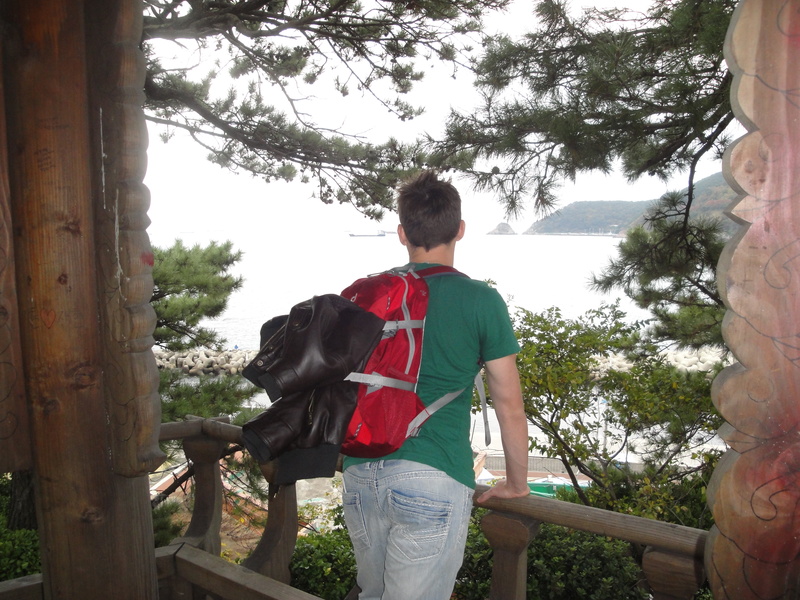 Once we finished exploring the market, our guests wanted to check out one of the hiking trails I had recently hiked. While they walked up the mountain, Kevin and I went to play tennis with a couple foreigner friends. 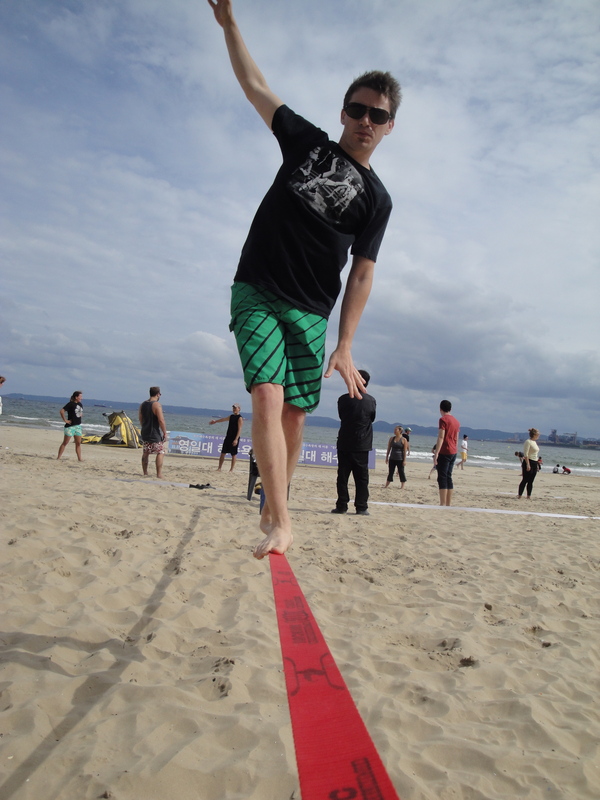 It was more Kevin playing tennis while I watched and also taught myself to juggle. This trick has came in handy for entertaining the many Korean children who wanted to talk to us during the tennis match. 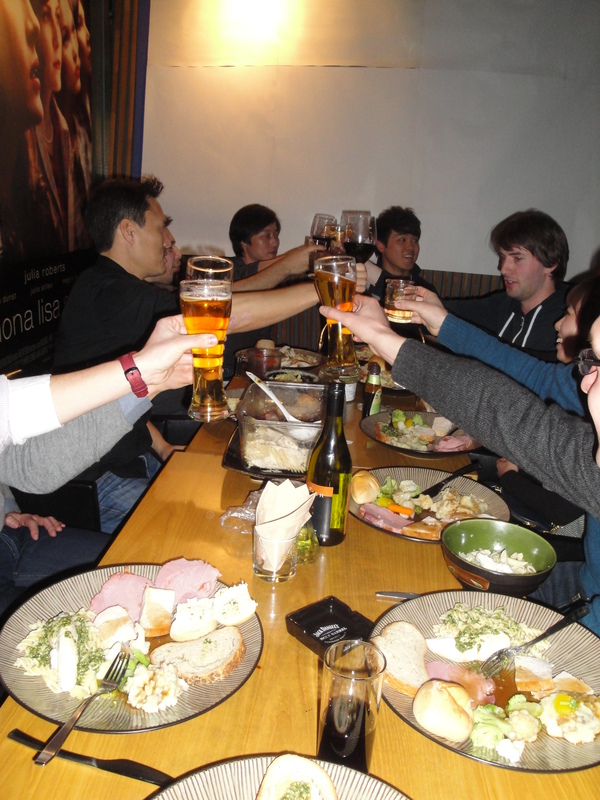 I had my first “famous” experience since arriving in Korea. The children wanted to talk to me, shake my hand (shaking my hand was a big deal for them, one girl asked to shake my hand three times), and also take their picture with me. I was happy to entertain the kids and help them practice their English! 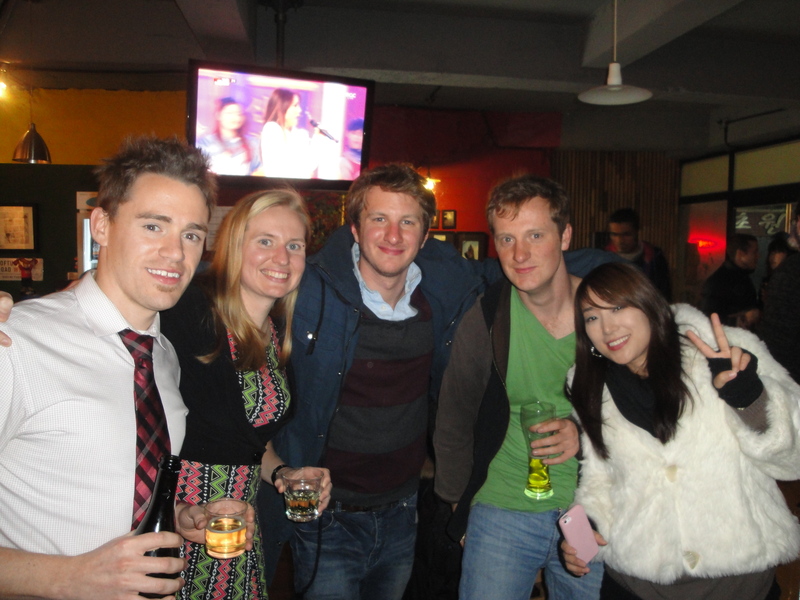 We had a good time hosting Aleksander and Karolina. I hope we will get to host more surfers while we are here in Pohang. It is all in Polish, but the pictures are awesome! Kevin and I purchased a scooter less than a week ago. 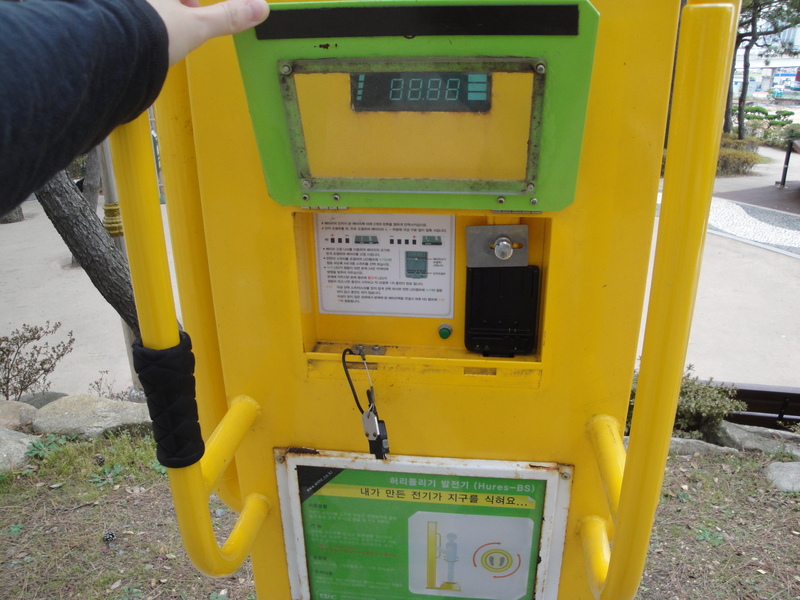 We have enjoyed using it to get around the downtown area of Pohang, but on Sunday we were determined to travel a little further. 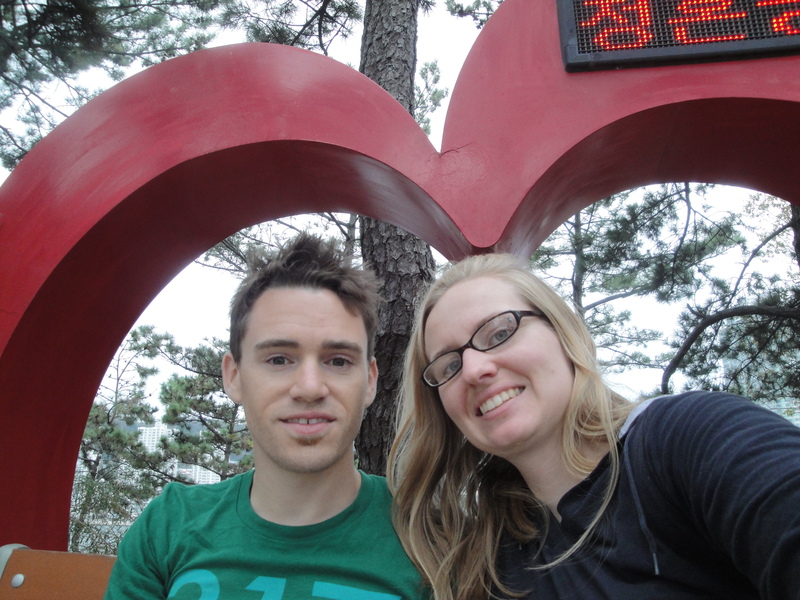 We decided to go to Homigot, it is the most eastern point of South Korea and only about an hour scooter ride from where we live. Kevin looking stylish in his leather jacket and helmet. On the way to Homigot! The drive to Homigot is fairly simple and well publicized. 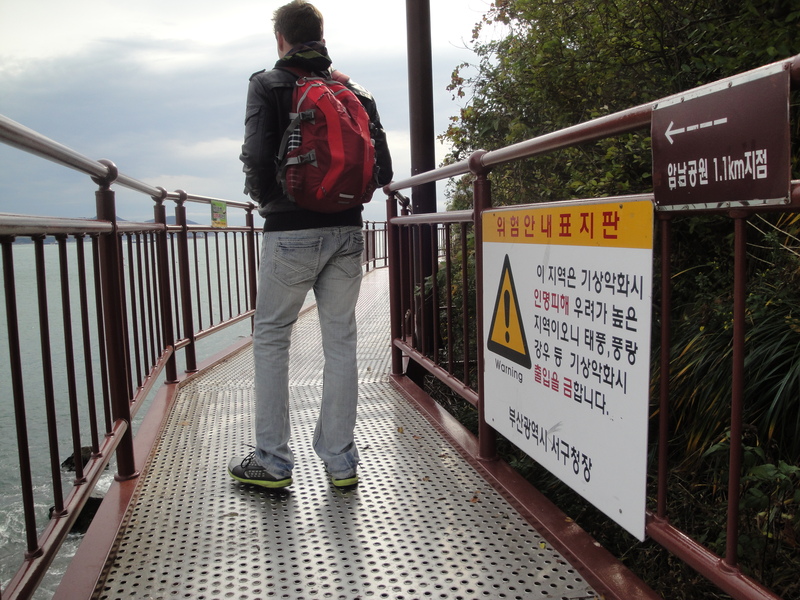 We basically followed signs that either said Pohang airport or Homigot and made it to our destination with ease. 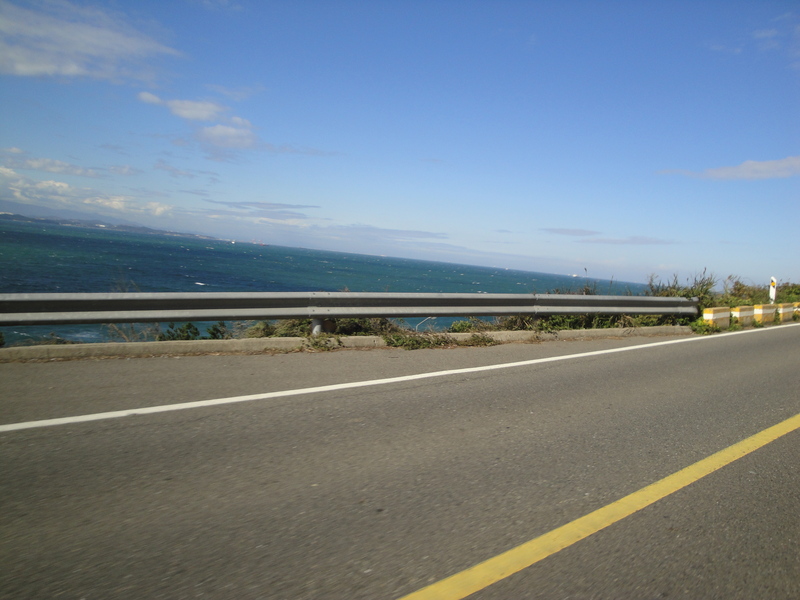 The drive was extremely pretty, we pulled over a few times to check the view of the sea. 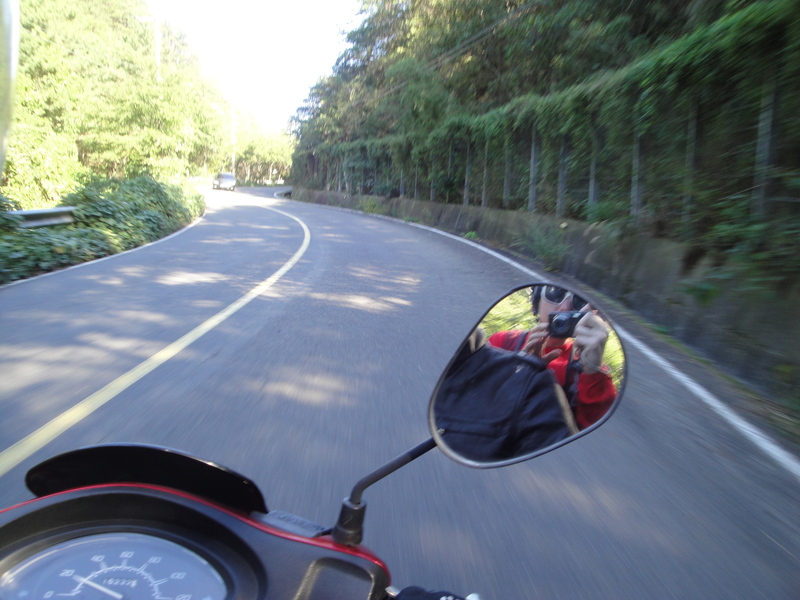 Side note: If you are on the fence about buying a scooter while living in Korea…do it. You will not regret it. Having a scooter gives you a lot of freedom to see more of the city and country. Also, it seems there is no license required. 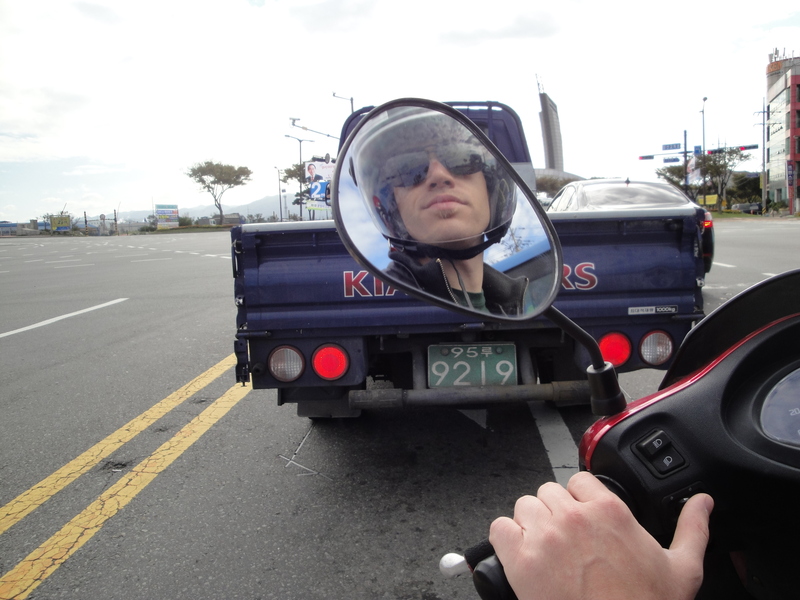 We bought our scooter off a fellow expat, no papers, no plates…welcome to Korea. 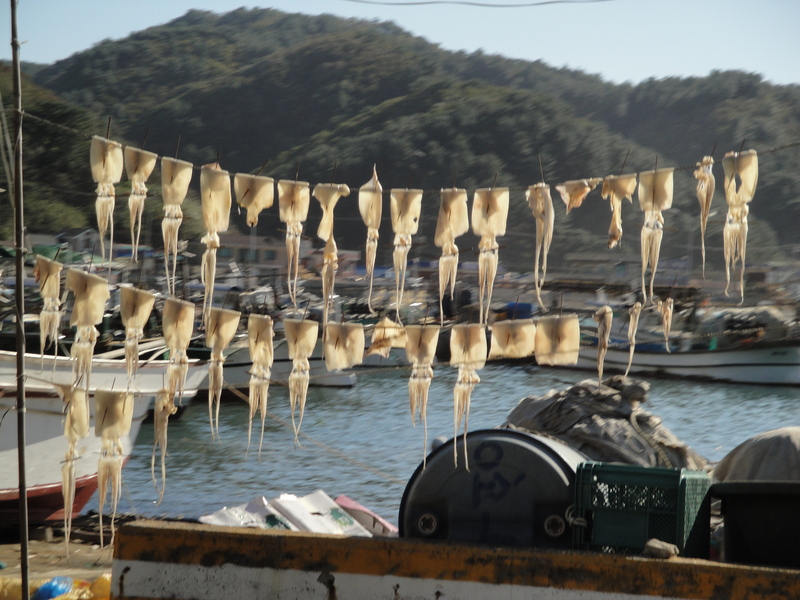 Another lovely and actually kind of cool site was all the squid drying in the sun. Something you don’t see in the Midwest United States. Once we arrived at Homigot, we navigated over to the Homigot Sunrise Plaza and ascended to the observation deck. 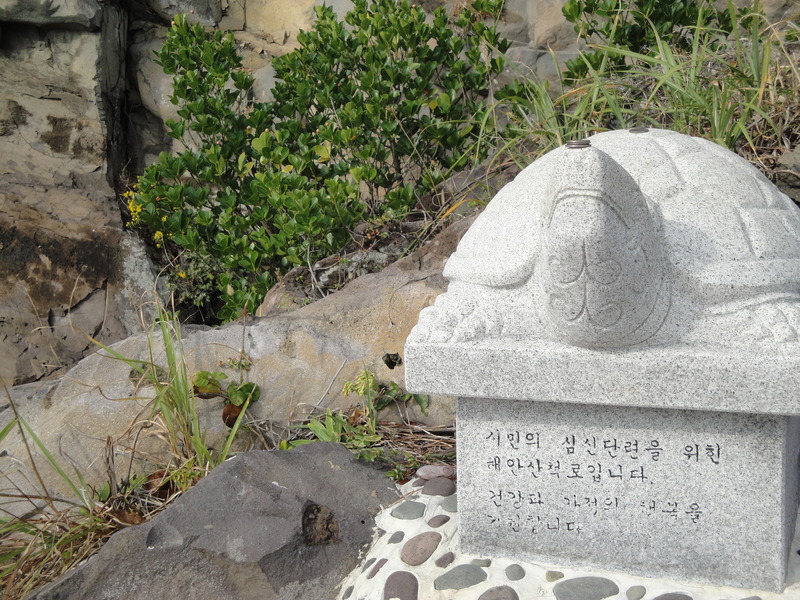 The visitor center is a small museum about Pohang and Pohang’s history. This landmark, Homigot, is a huge attraction on New Year’s Day. 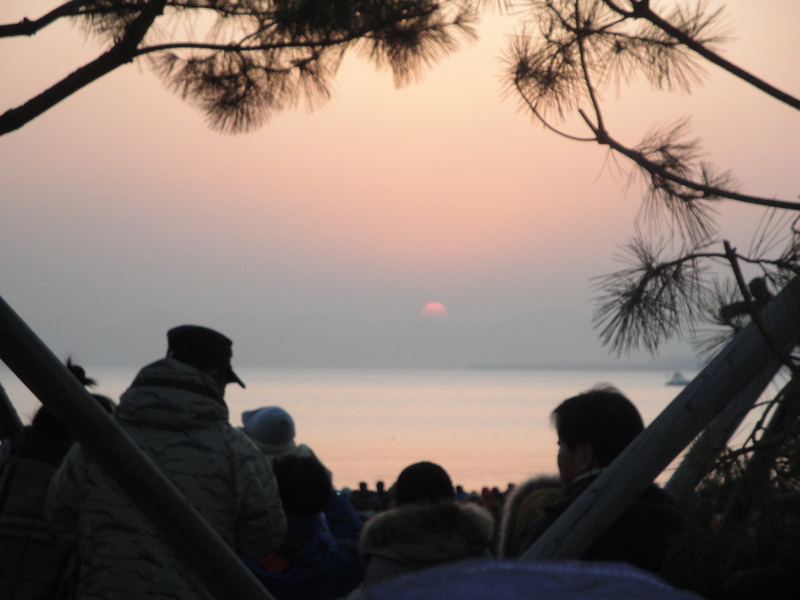 Many Koreans will travel to Homigot to witness the first sunrise of the new year. 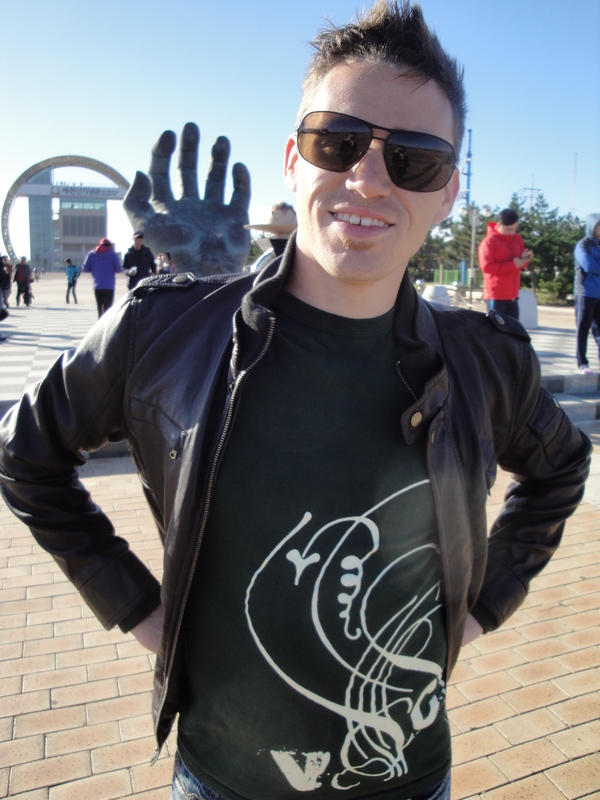 There are some hand sculptures, palms facing each other, which symbolize harmony and coexistence. 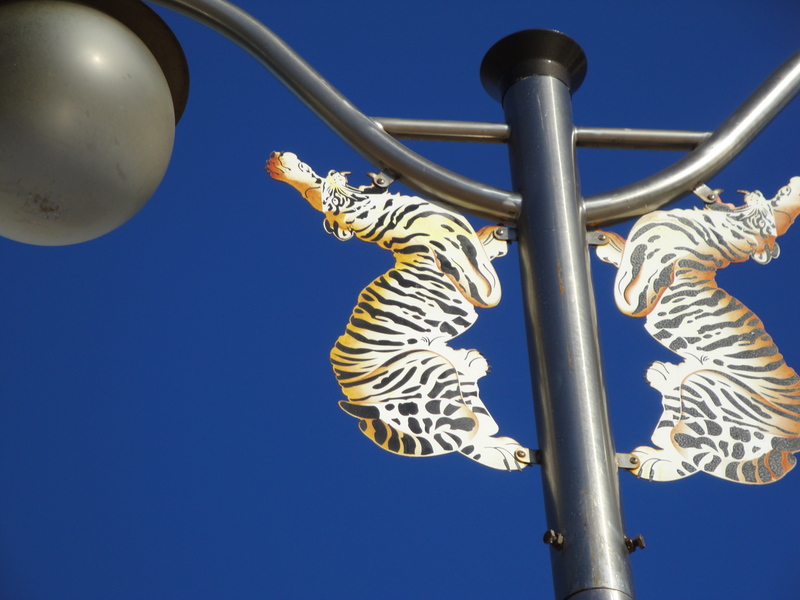 “Homigot” means Tiger’s Tail Cape, which explains why we saw so many pictures of tigers everywhere. 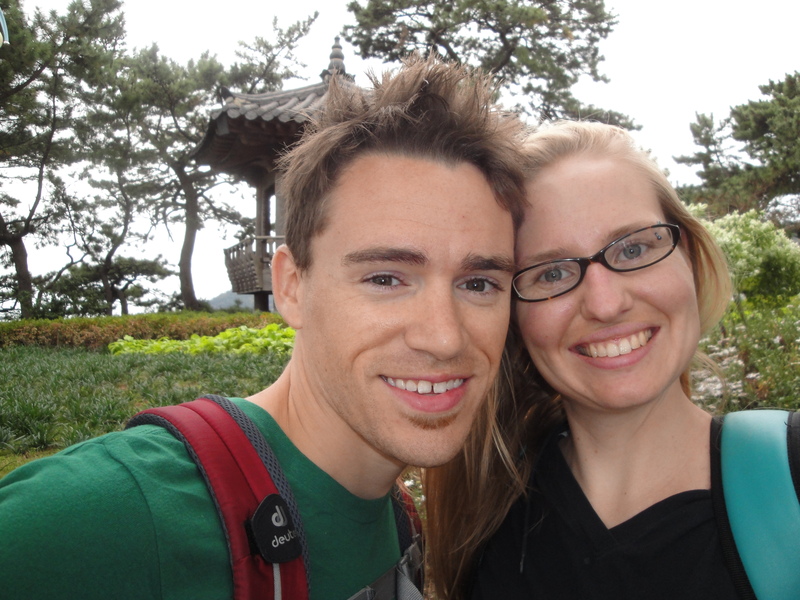 This was a wonderful trip and a great way to celebrate our first month in Korea. I hope many more trips will take place over our time here. It has been a really long time since my last post! This has been due to moving, buying furniture and also just being out of the house a lot. We moved into a brand new apartment a little over a week ago. 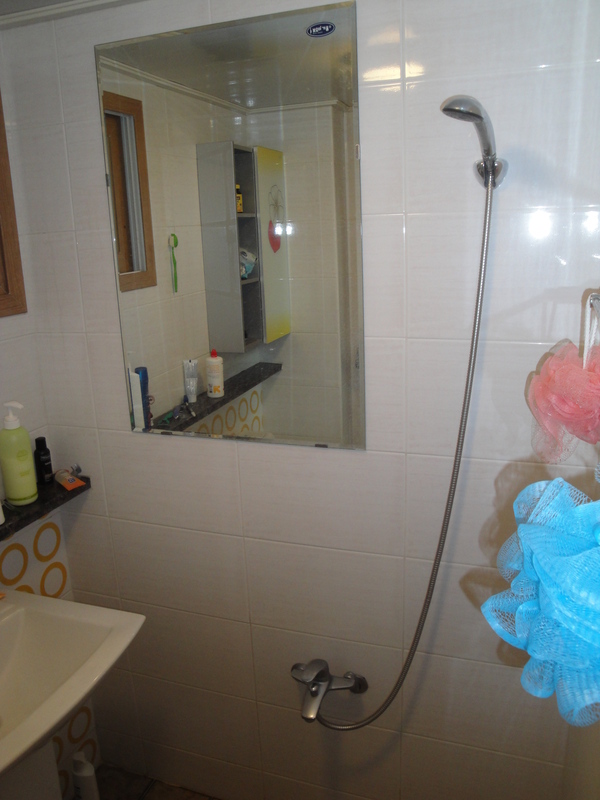 It is a 2 room apartment. 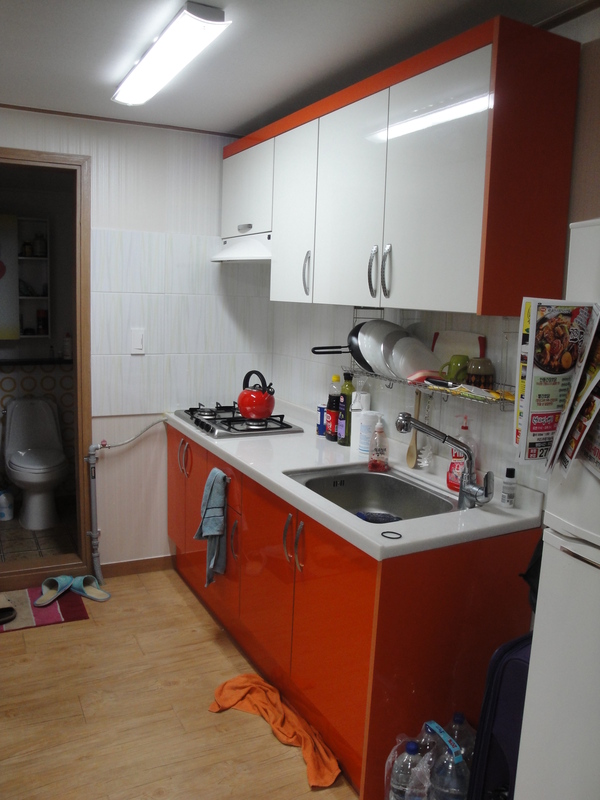 In America it would be considered a small one bedroom apartment, but here in Korea this is quite the find! Much thanks goes to our director at the school. 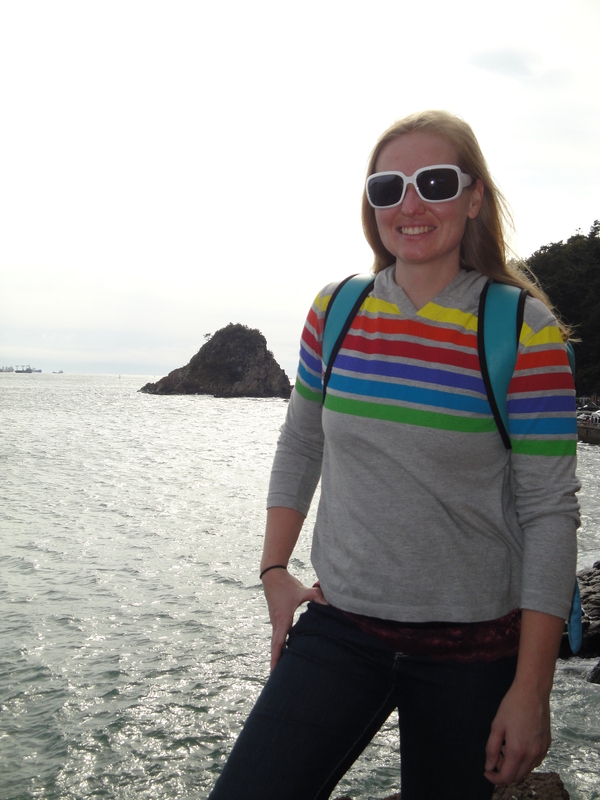 Speaking of school…I have finally started teaching! I have been teaching for about a week now and getting use to the schedule, after being FUNemployed for almost 2 months, has been a little difficult. I teach kids as young as 6 and as old as 15. Teaching different ages has actually been pretty nice, if I taught 6 year olds all day long I think I would be incredibly tired at the end of the day (props to Kindergarten teachers, how do you do it?). 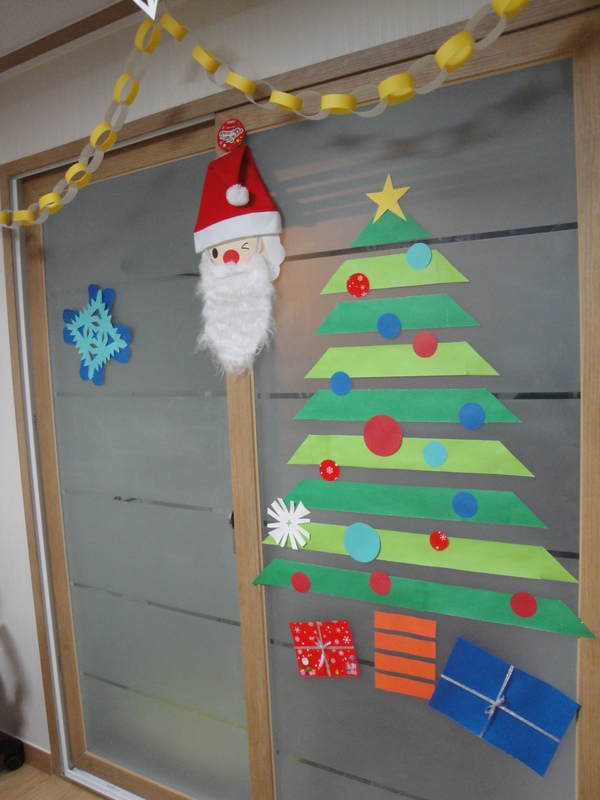 If I hadn’t mentioned it before, I am teaching at a Hagwon (a private English academy for kids). I teach from 4:00pm to 9:30pm every weekday. One can tell, as the night goes on, these middle school kids are very tired. They go from public school straight into to their English studies. It’s hard for me to imagine going to school all day and then essentially going to school all night, then going home to do my homework. But enough about teaching for now. 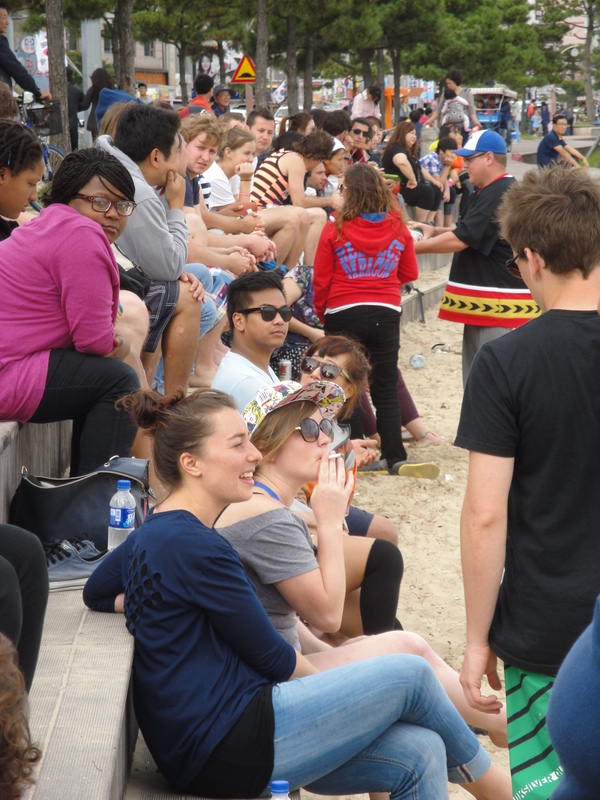 A lot of Waygooks made it out to the beach! It seems most everyone gets around my motorcycle or scooter. That is one reason Kevin and I decided to buy a scooter! I will post pictures soon! 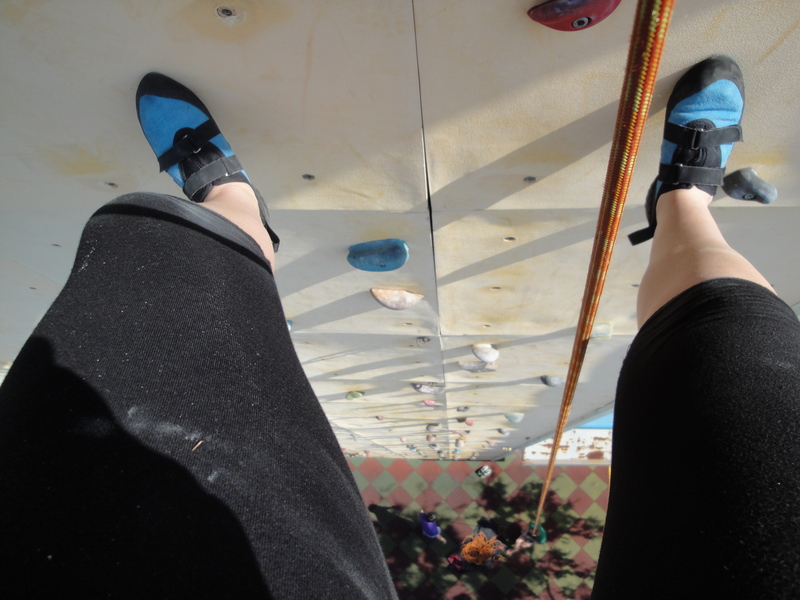 One of our Korean friends, from our school, drove us out to the artificial outdoor wall in Pohang. 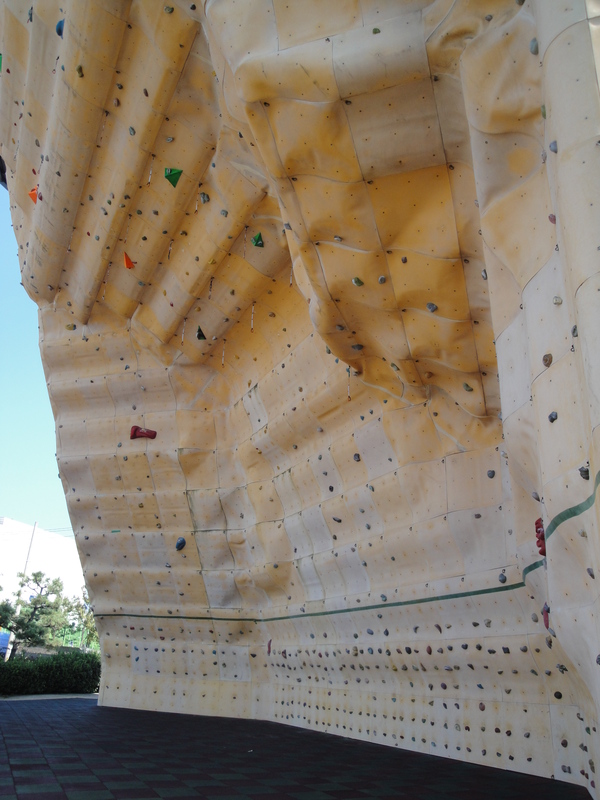 It is the tallest artificial wall Kevin and I have ever climbed and the tallest artificial wall in Korea (65.6 ft or 20 meters). 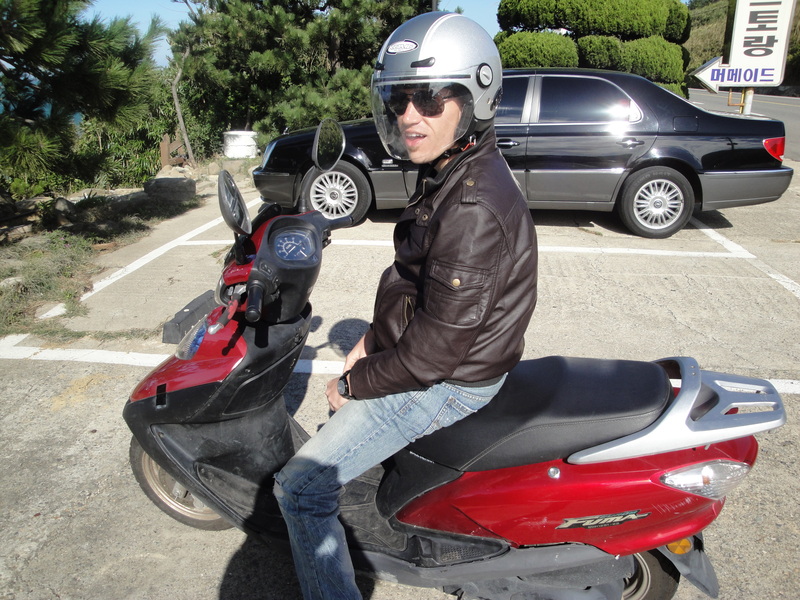 It was a very exciting experience and now that we have the scooter, we can go back as often as we want (we will just have to deal with the cold). Here is the massive wall in all its glory. 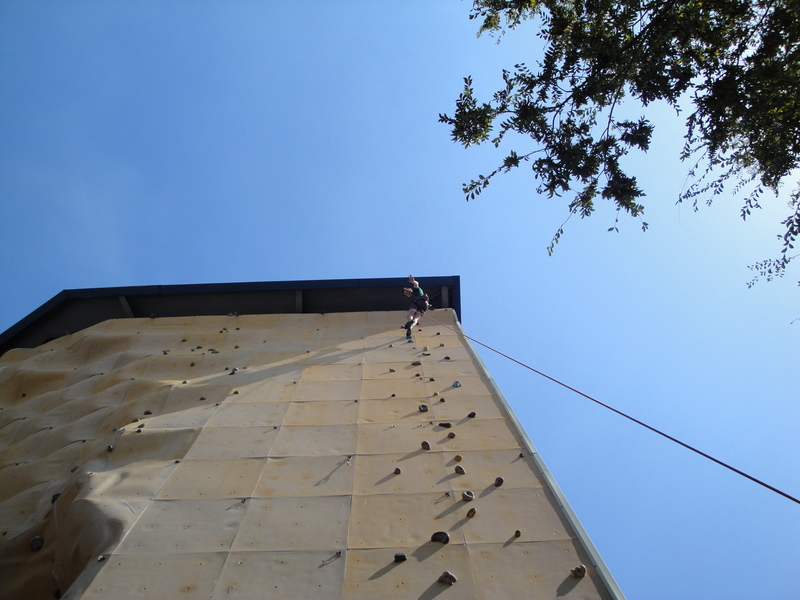 This is Kevin at the top. 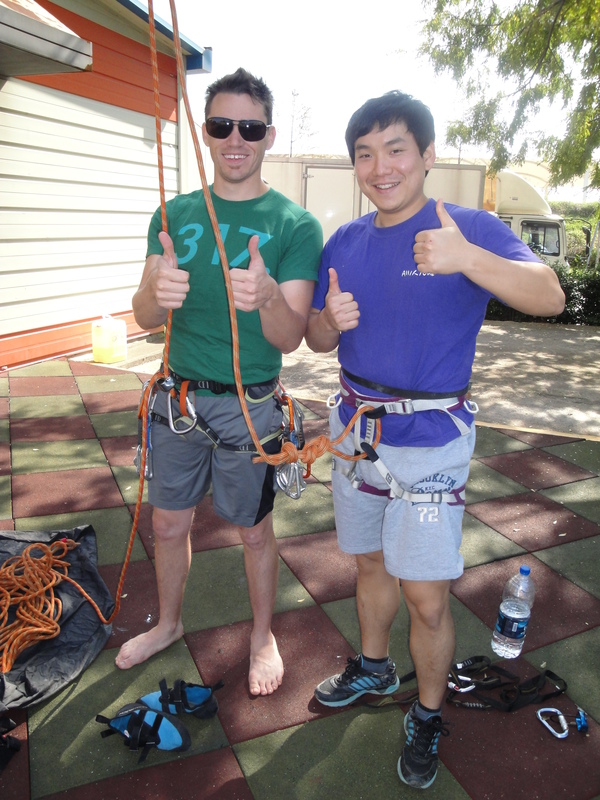 Kevin and Joon-Ho are ready to go! 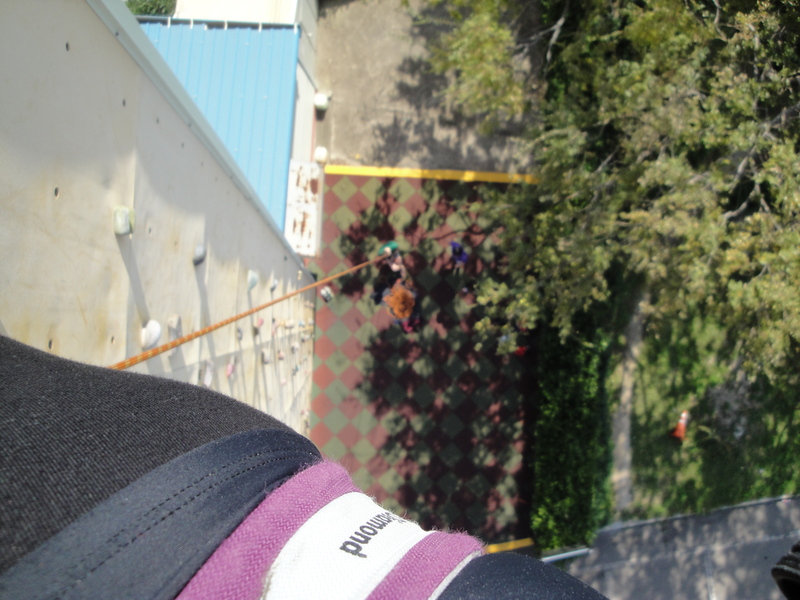 These were all views from the top of the wall (don’t worry mom, I had my camera clipped to me, no way to drop it).